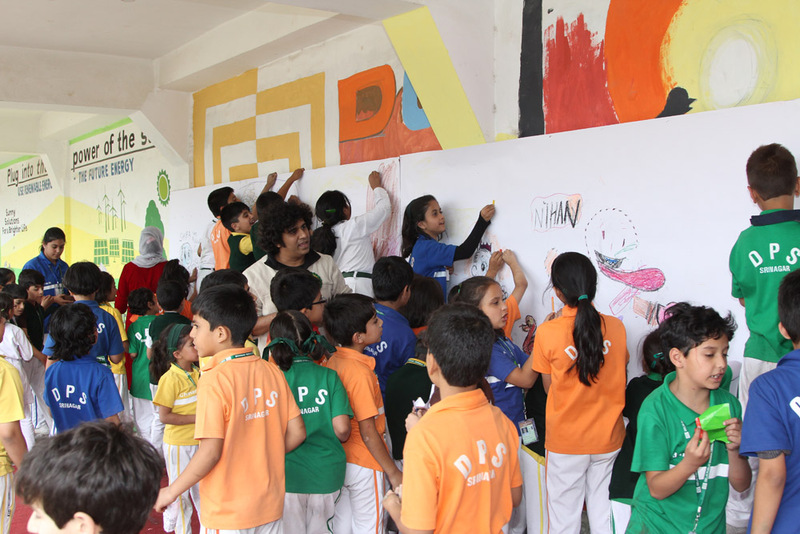 Doodle Wall: Ashok Rajagopalan curated the session. 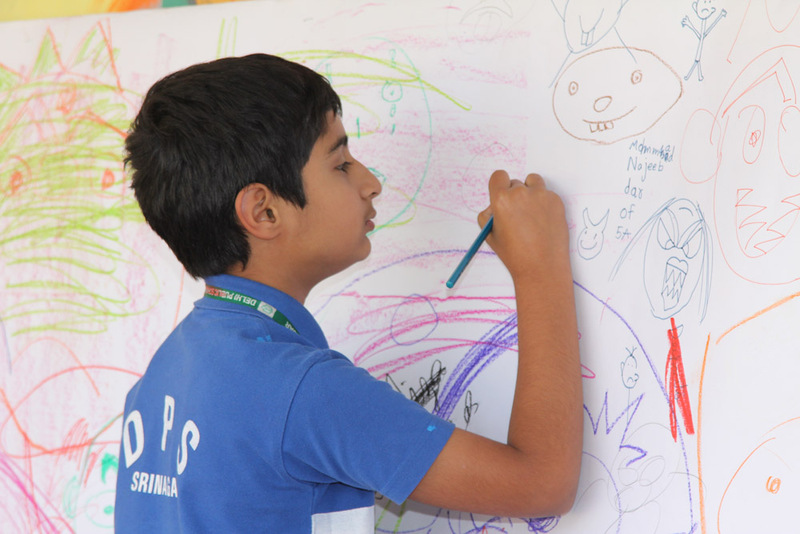 Children were appraised about different moods, and emotions through expressions via an interactive sketching session. 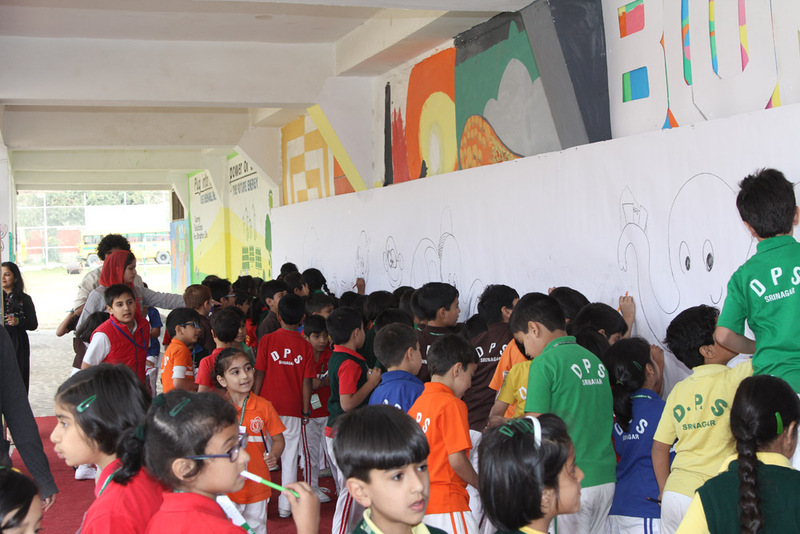 The children were bewildered and fascinated by the sheer scale of emotions that they can draw. Dastaangoi: Fouzia curated the session. 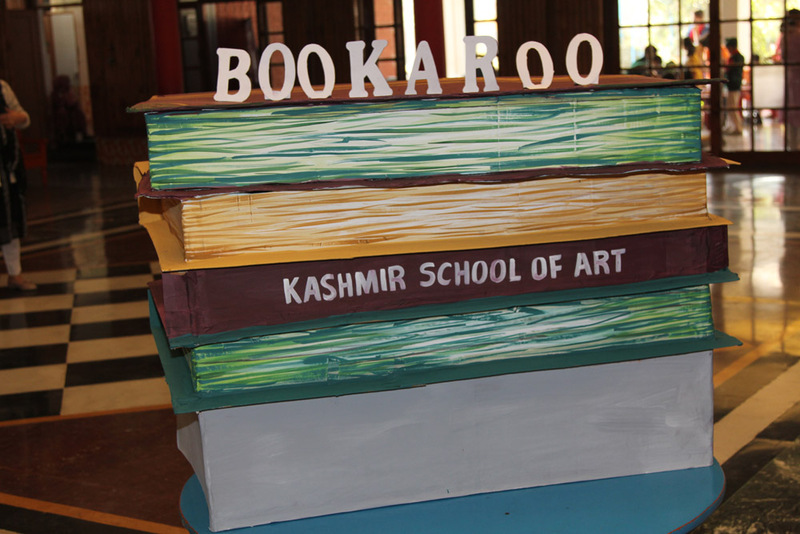 She is the first woman dastaango of the country and engaged in reviving the ancient art. 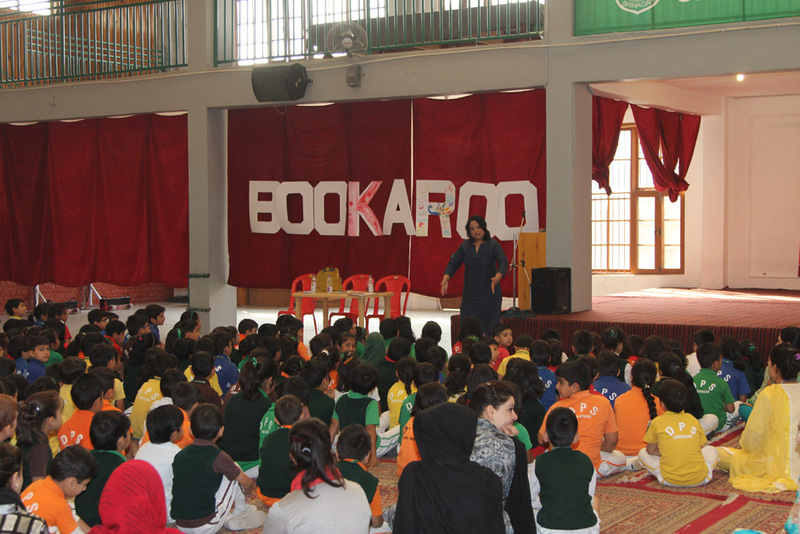 She captivated the young students by a fascinating narration of various popular stories. The emotions of characters were portrayed marvelously and the faces of the students mirrored the sequence of events and emotions. Studio: Deepak Dalal curated the session. 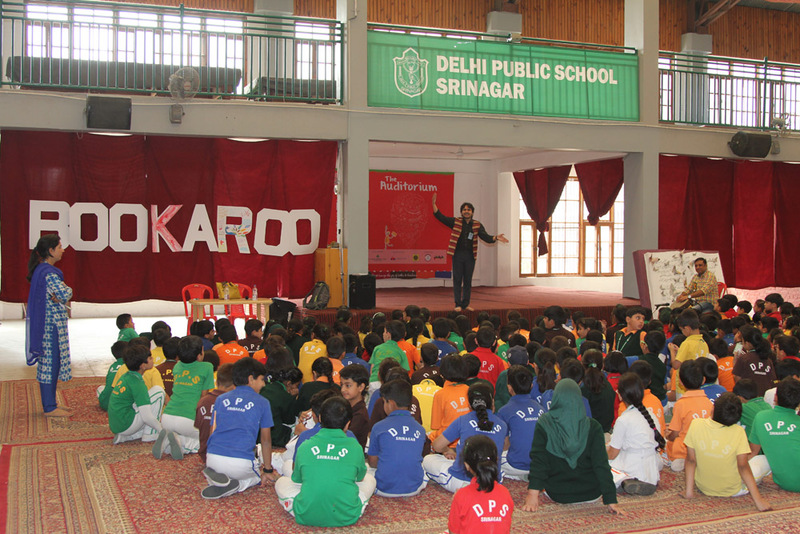 Through an interactive session filled with pictures, he made students aware about the various birds of Kashmir and the country. The kids were quite immersed in the colorful pictures. Workshop: Ajay Dasgupta curated the session. He narrated three stories full of comic laughter, surprise and action. His expert use of sensations, expressions, gestures and voice modulations grabbed the attention of students by the collar. 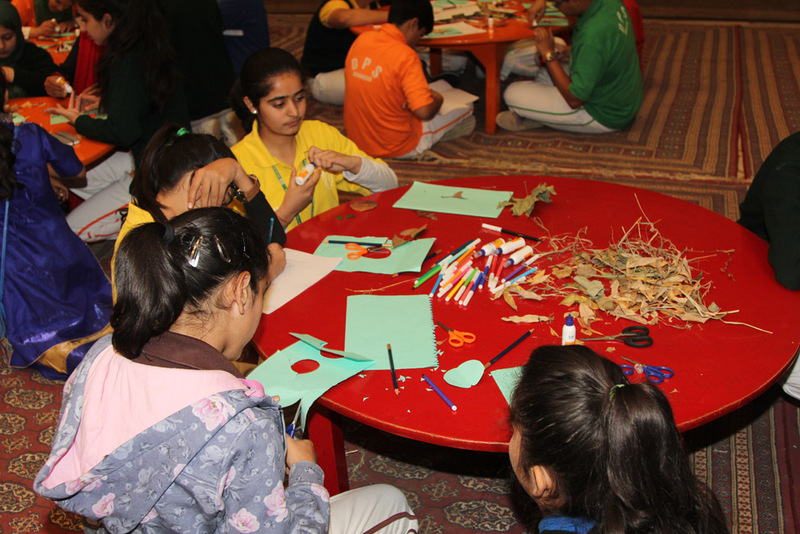 Without even noticing, the students were educated about pressing issues like environment conservation, ethics, and response to fear. 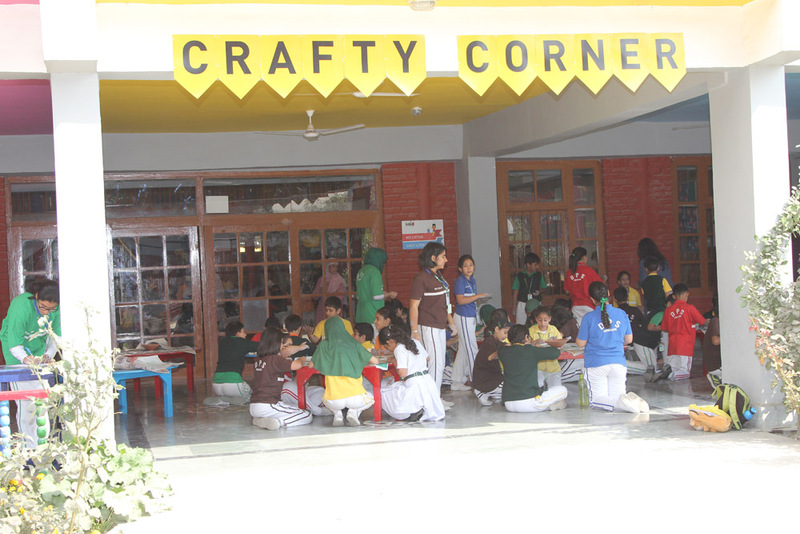 Craft corners: These sessions were curated by Ludwin Mascarenhas, Indu Kumari and Kavita Singh. 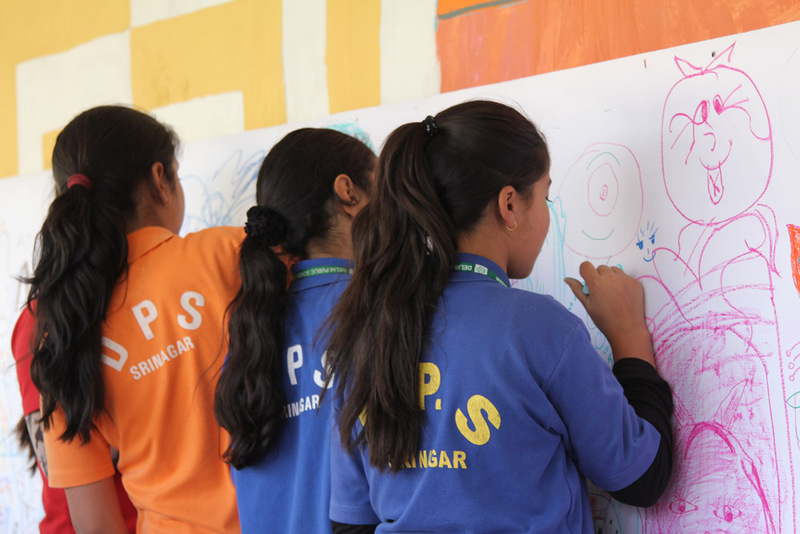 Students were trained in different art forms through interactive sessions. 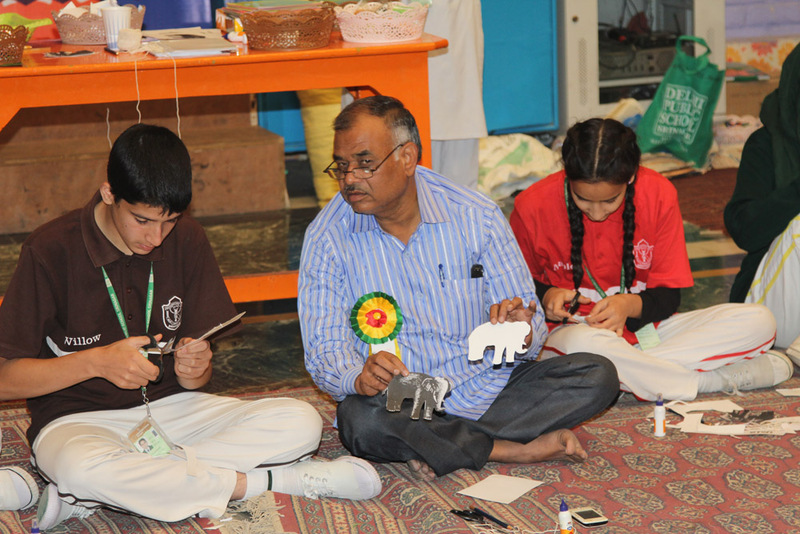 The forms including creating art through waste material like rags, discarded paper, cardboard strips and bottle caps, creating clay models of insects like butterfly and flowers. 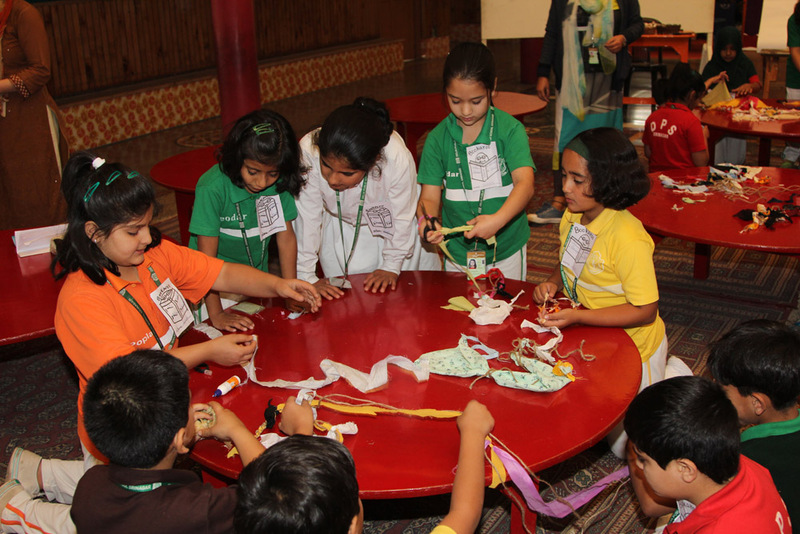 Children also learnt to make jute ropes and tie them. 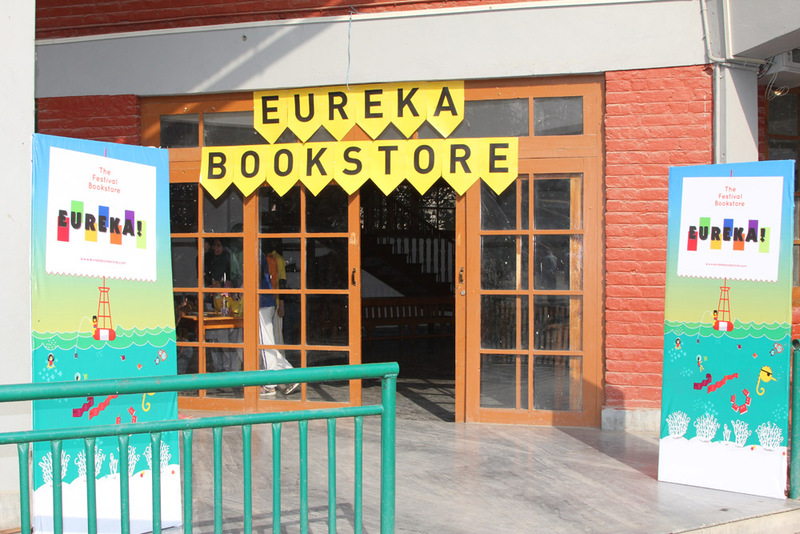 Patchakatha: These were two sessions of storytelling one held jointly by Jeeva Rgunathan and Amin ul Haq, and the other held by Ajay Dasgupta. 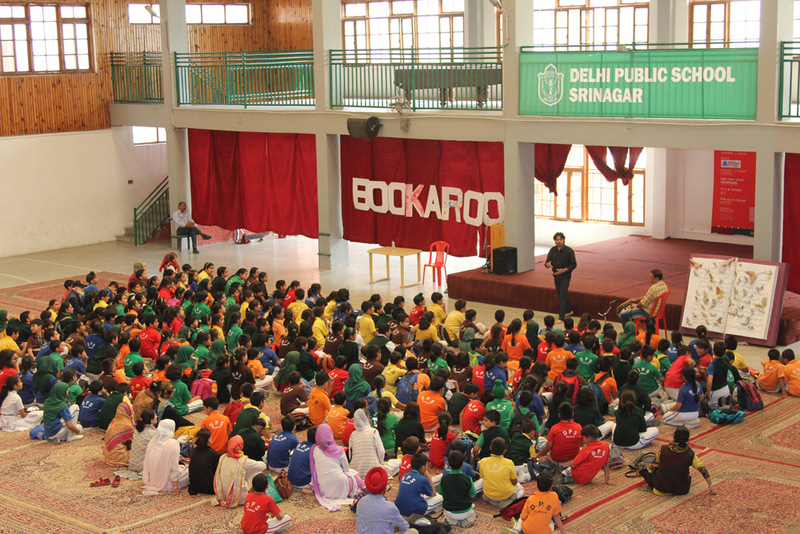 The students were entranced by joyful yet expert rendition of two stories – one a delightful story about common sense, and an extract from the famous epic – Ramayana. 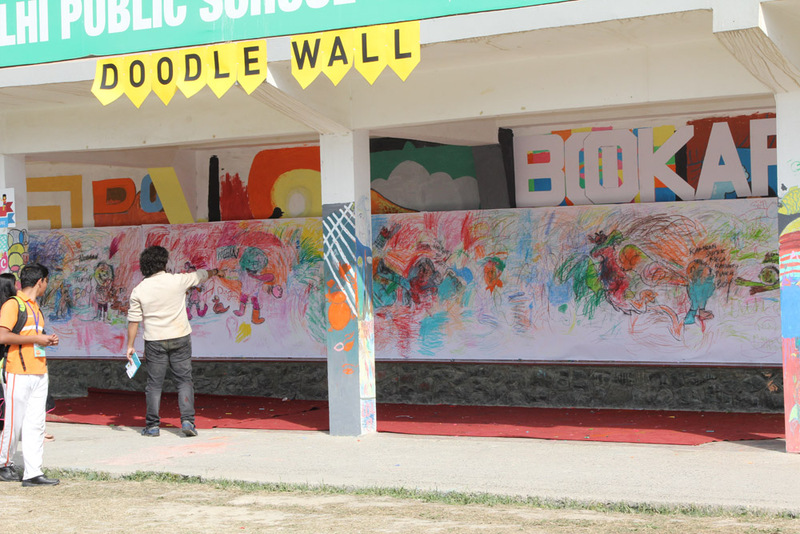 Doodle Wall: Chetan Sharma curated the session. 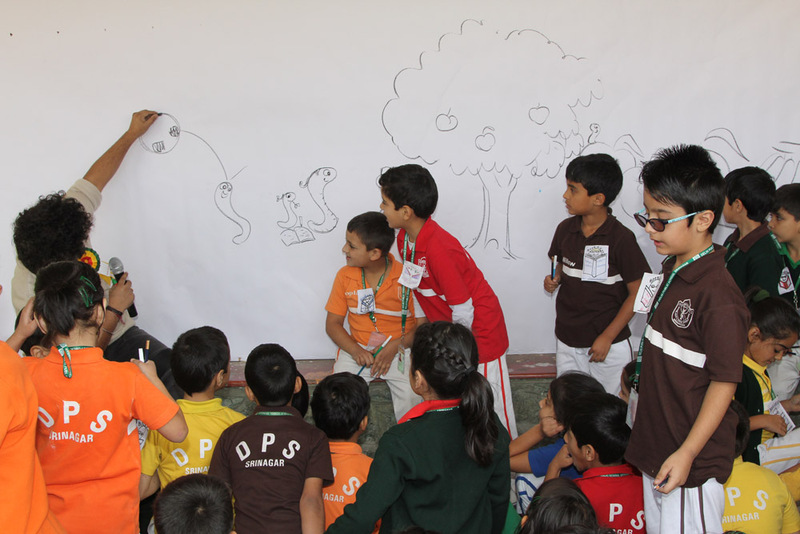 Through an interactive sketching session, he demonstrated to the fascinated students an open ended story told through drawings. The children contributed to the story with all enthusiasm and delight. Workshop: Ashok Rajagopalan curated the session. He held the attention of students’ hostage with stories filled with moving pictures. In one such story, the children mimicked the twinkling of stars by flapping the paper stars drawn by them. 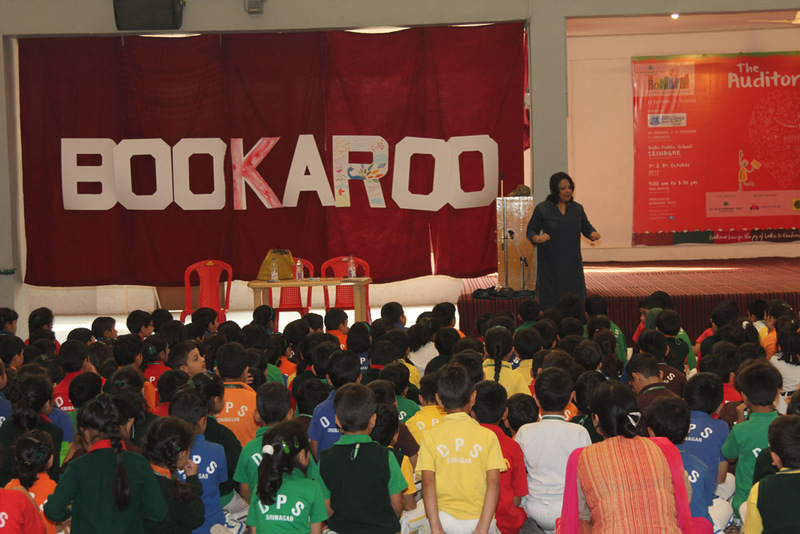 The children enjoyed the sonorous fun of Guajarati Kulapati throwing in their excited voices with that of curator. Studio: Sandhya Rao curated the session. 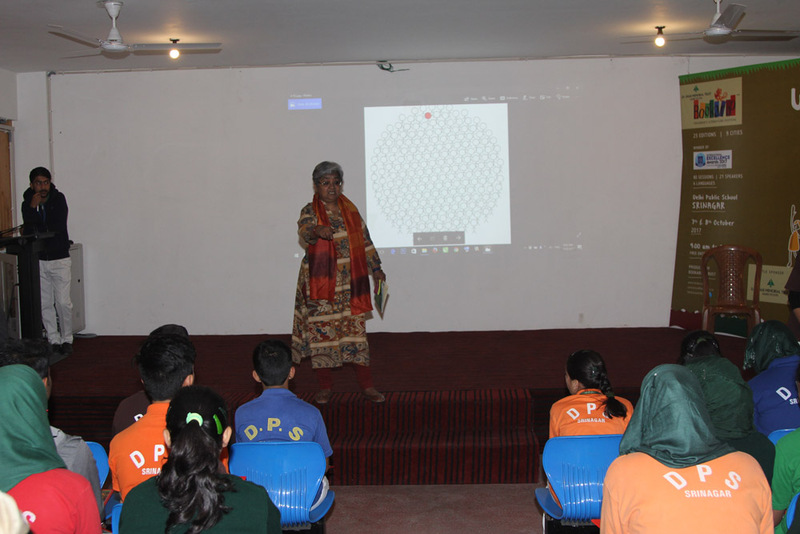 Through an interactive session filled with pictures on PowerPoint slides, she introduced students to the world of colours. The kids were quite immersed by colorful pictures of beaches and natural locales. They responded enthusiastically to each query and enjoyed the melee of colours. 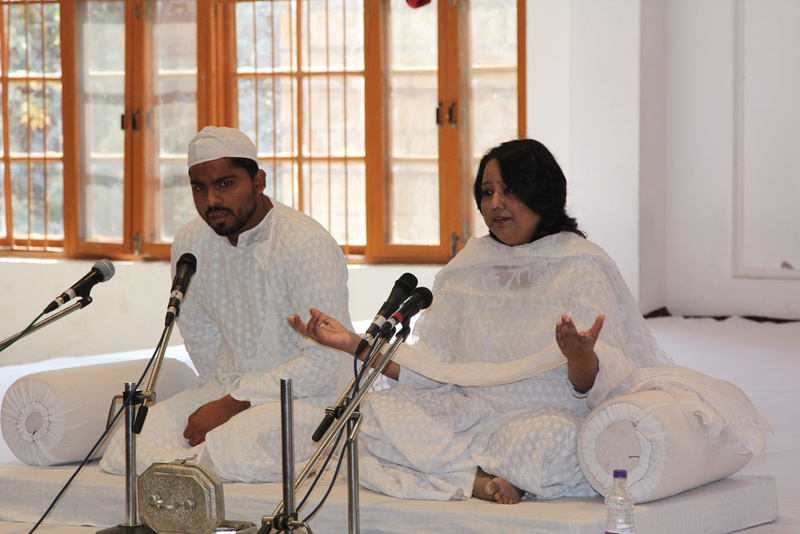 The Auditorium: Kameel Pruthi (vocals) and Rajeev Bandhani (tabla) curated the session. They performed a musical tale of the ‘Blue Kangaroo’ before the students. Apparently a story about the reaction of a child’s reaction to the newly born sibling that has just been brought home, the beats of table lent it a strange charm that made the students listen to it with unfeigned delight. Case in point the musical apology offered by the young child to the parents. More delightful, sincere yet joyful apologies can seldom be found in real life. 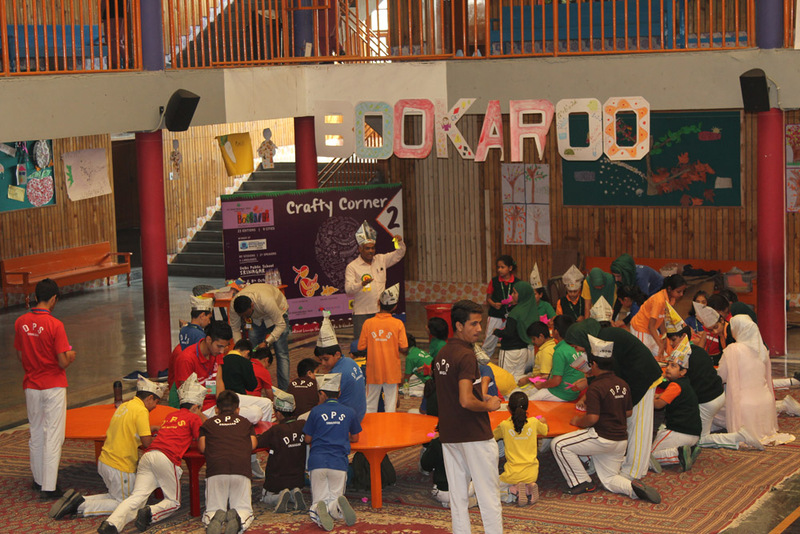 Craft corners: These fun filled sessions were curated by Ludwin Mascarenhas, Team DK, Team Amar Chitra Katha and team Eklavya. Children roused their detective skills and solved mysteries by piecing clues together. The hush and anticipation that followed each clue was a delight to savour. Other sessions included crafting a rudimentary hand puppet, and drawing a frowning clown from mud. 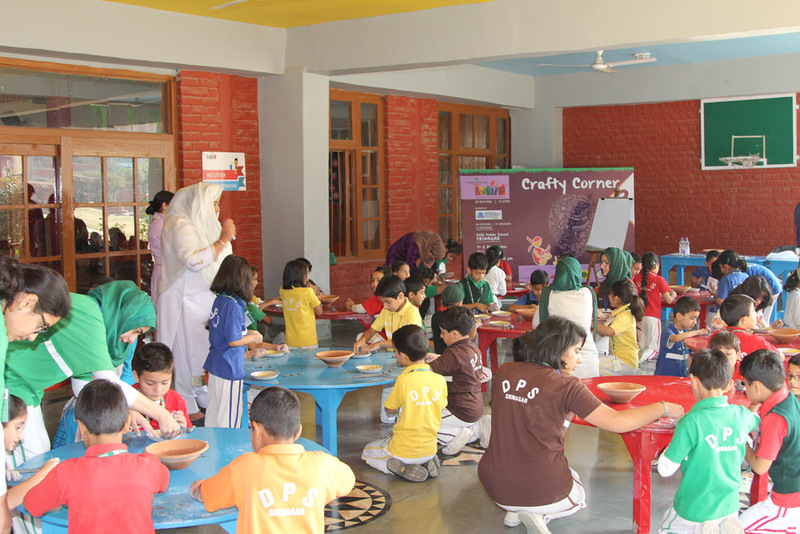 One other session mirrored that of the first session where students learnt to put waste material to good use and create useful things like a cap or a paper boat from scrap paper, glaze papers etc. 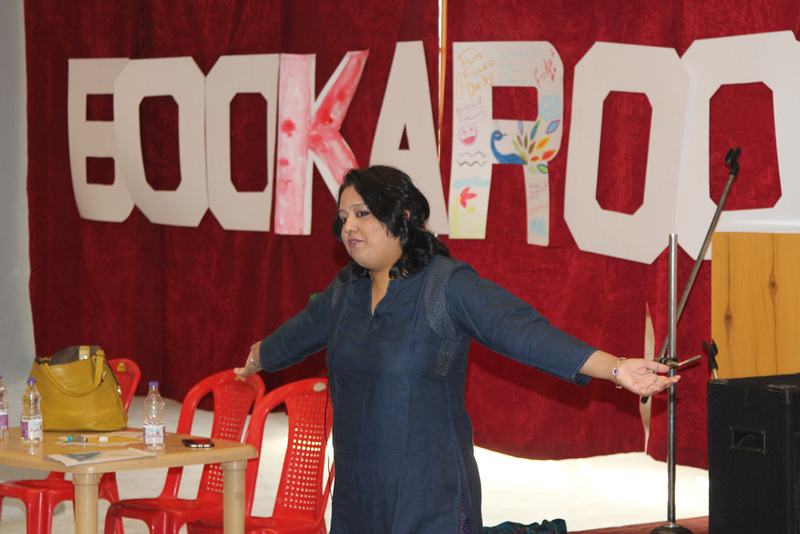 Patchakatha: These were two sessions of storytelling once again held jointly by Jeeva Rgunathan and Amin ul Haq, and the other held by Ajay Dasgupta. 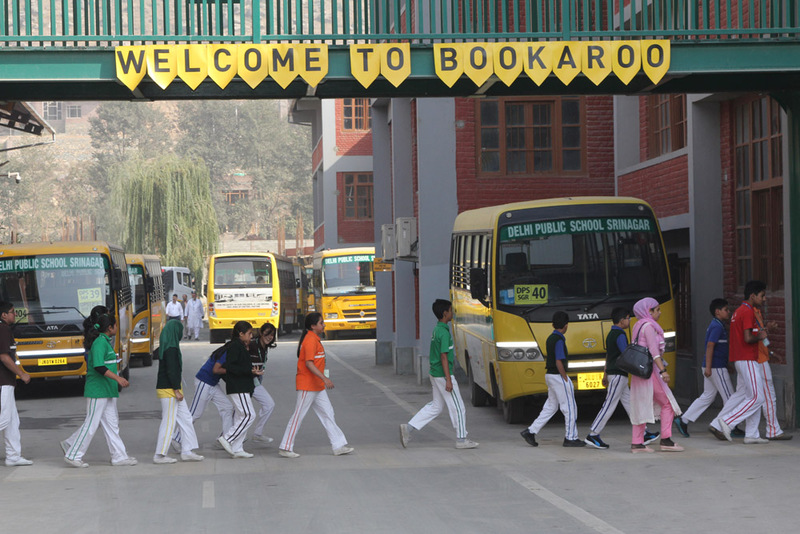 The students were mystified by the tales with hairpin bend ending, and more importantly important lessons. 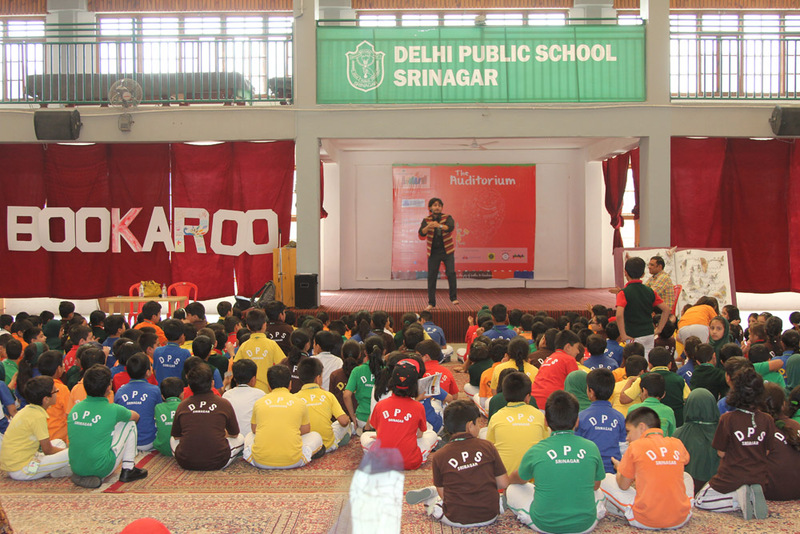 Jeeva held the attention of a raucous crowd of eager students through fun activities like clapping to numbers and merry shouts. 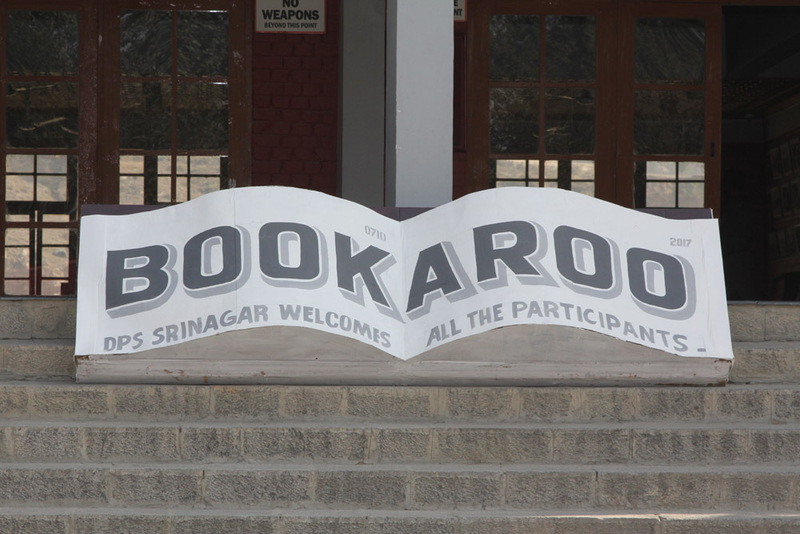 Sounds of laughter and glee regaled the dull environs of the room and transformed it into a breathing space of fun and joy. 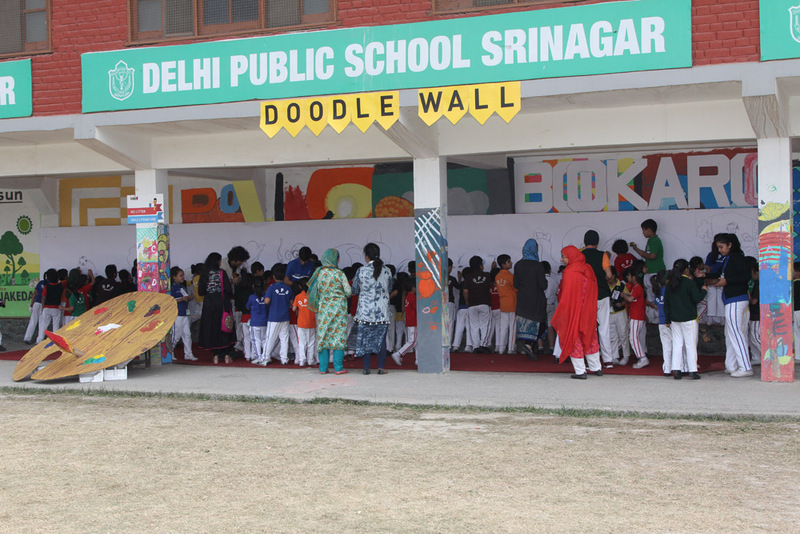 Doodle Wall: The renowned artist from Kashmir – Masood Hussain curated the session. 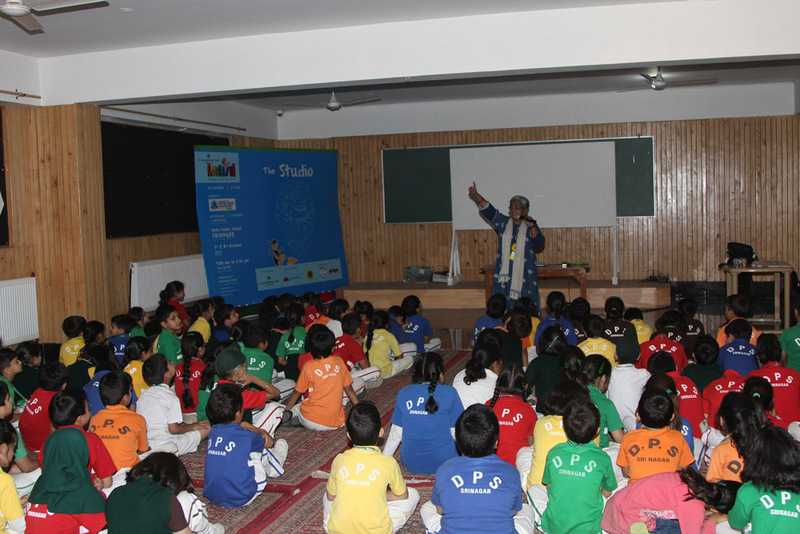 It was heartwarming to see an artist of his stature transfer his expertise to the students with childlike enthusiasm. 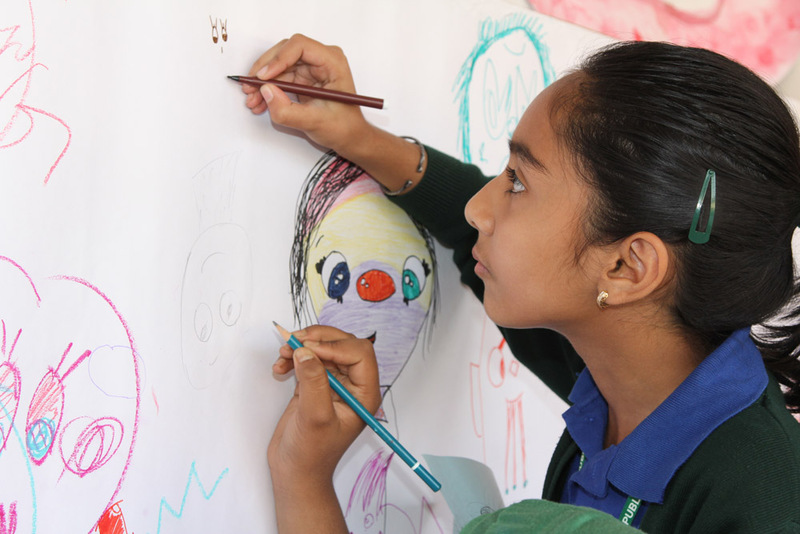 The students created various sketches e.g. of a flower and kept improvising adding colours and little details as they went along. Workshop: Ms. Rajni curated the session. She delivered an insightful talk on the elements of the story. 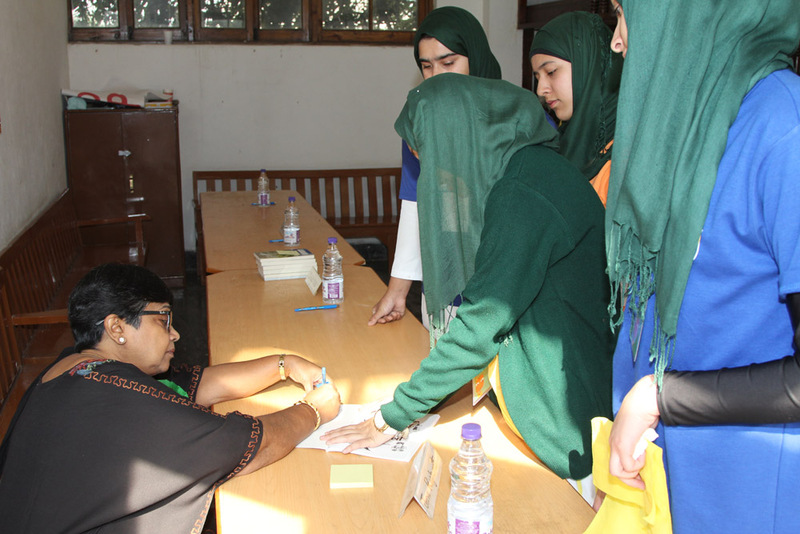 She introduced students to the importance of identifying and creating elements like costume, dialect, settings, dialogue and character traits for a successful short story. Studio: Deepak Dalal curated the session. The session revolved around an important life lesson i.e. not to give up in adversity, and fight against all odds like birds. Employing carefully selected videos, he introduced students to the ingenuity of birds who reach their destination without the aid of any maps, or paraphernalia. 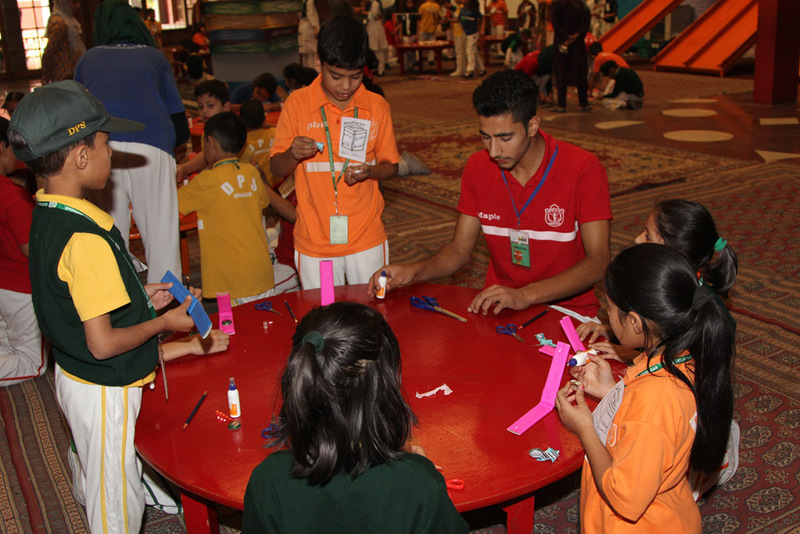 They only use sunlight and stars as their reference points, thereby asking students to understand that success doesn’t require plentitude, rather it is conditioned by determination. 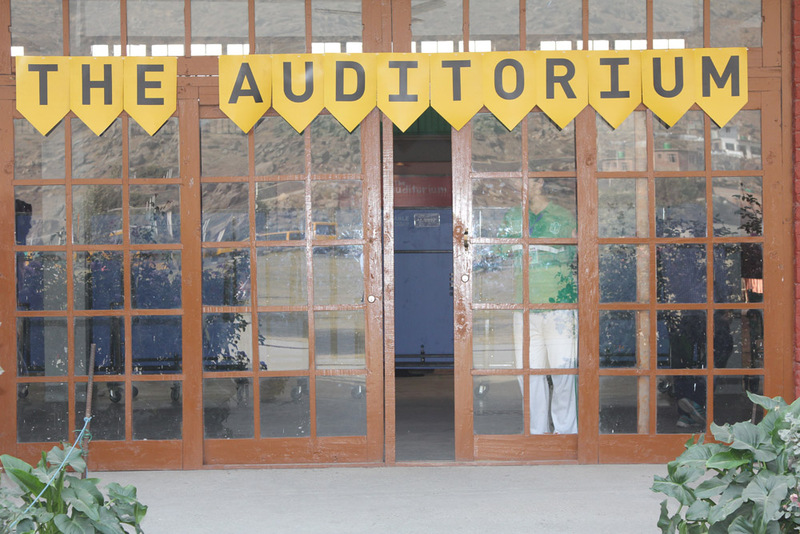 The Auditorium: Fouzia – the dastaango curated the session. She performed various fables with animal characters. The audience was regaled by her expert and accurate mimicking of various animal voices in a singsong way. By making animals interact with each other, she introduced students to dialogue creation. 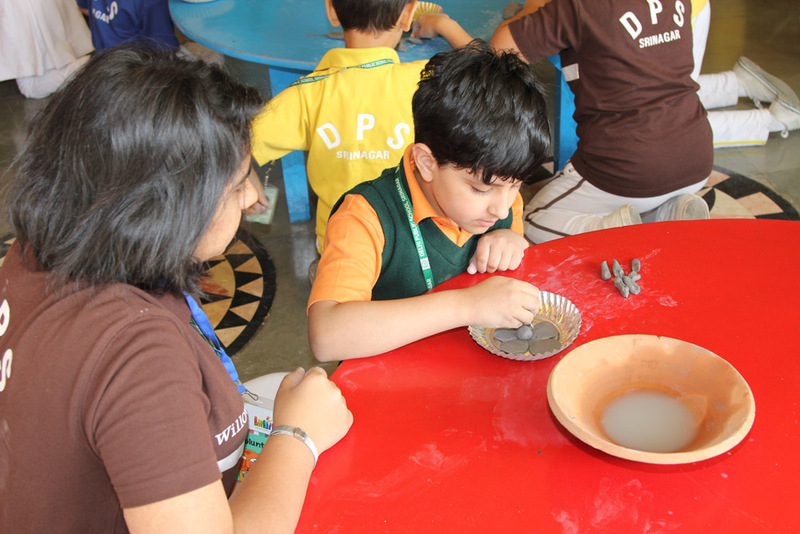 Craft corners: These fun filled sessions were curated by Ludwin Mascarenhas, Team DK, Kavita Singh Kale and Indu Harikumar. 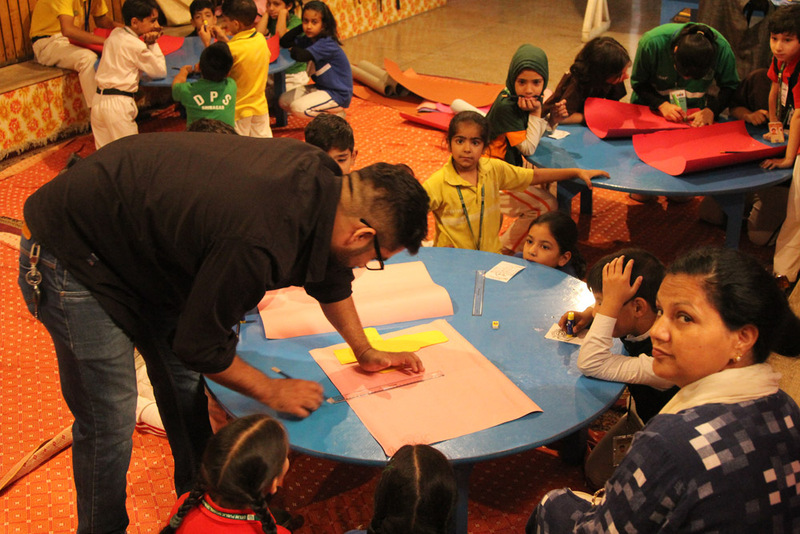 Children roused their detective skills and solved mysteries from Amar Chitra Katha by piecing clues together. The hush and anticipation that followed each clue was a delight to savour. Other sessions included crafting a rudimentary hand puppet, and drawing a frowning clown from mud. 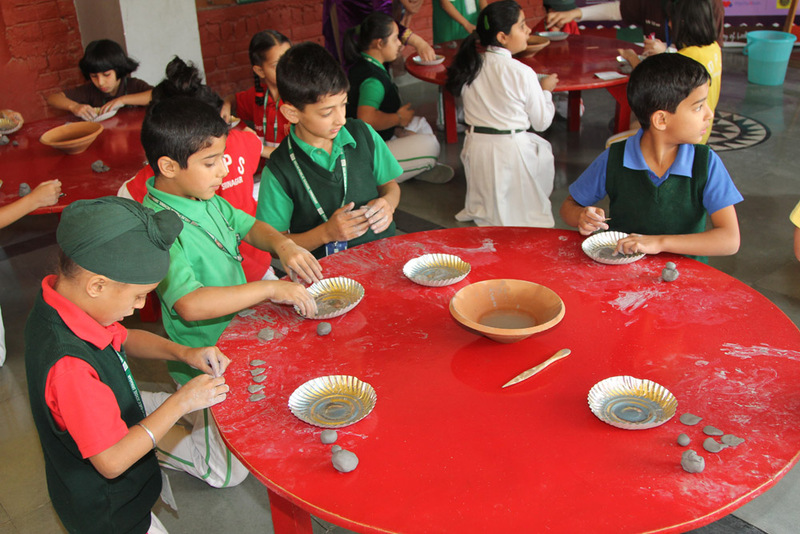 One other session mirrored that of the first session where students learnt to put waste material to good use and create useful things like a cap or a paper boat from scrap paper, glaze papers etc. 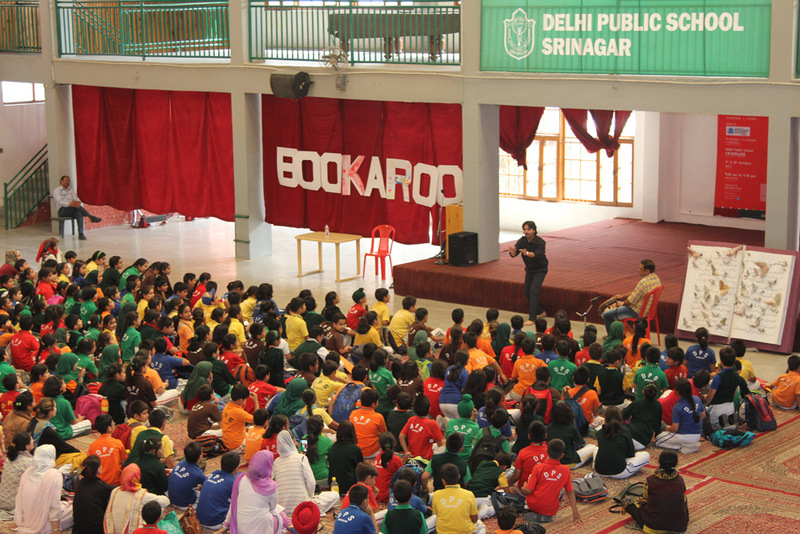 Patchakatha: These were two sessions of storytelling once again held jointly by Jeeva Rgunathan and Amin ul Haq. 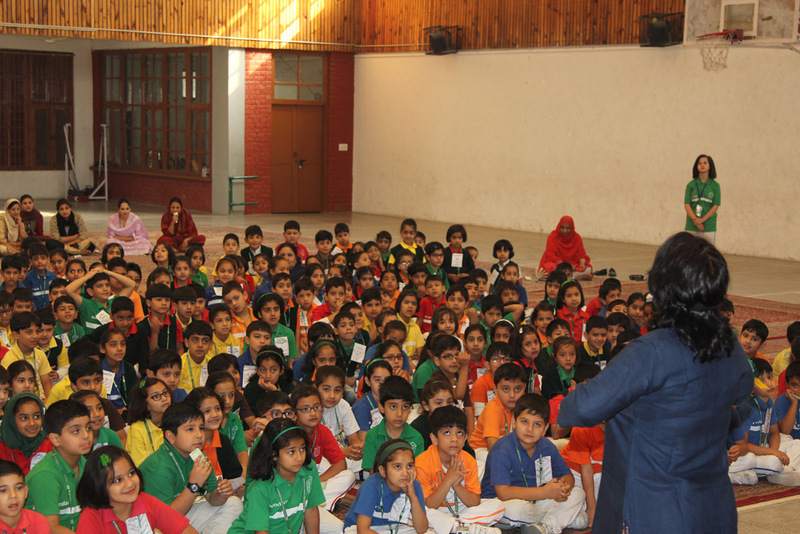 The students enjoyed observing the diverse nuances of moods and emotions of the characters. 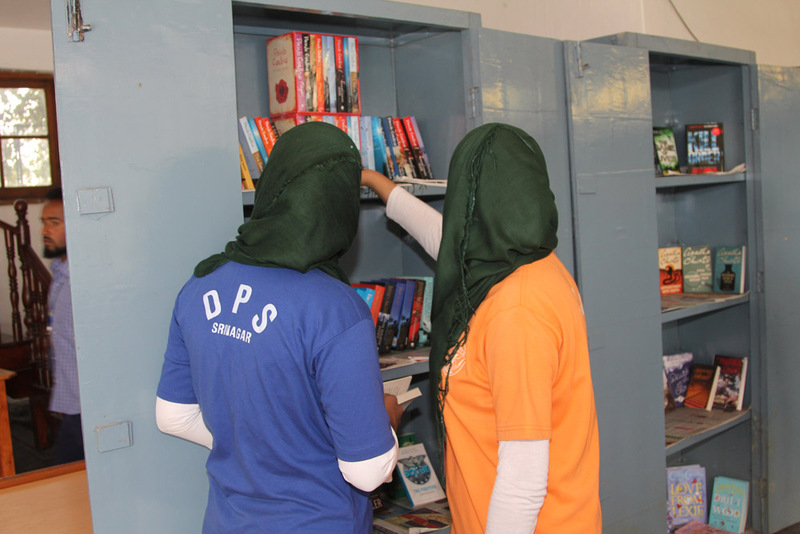 They were introduced to the art of sociolect as they learnt to imitate and recognize the voices and mannerisms of people from different classes like a factory owner or a labourer. 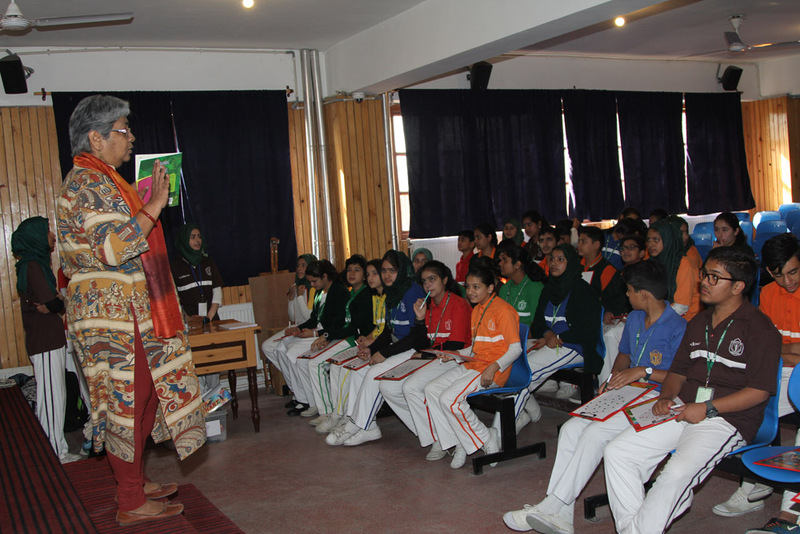 Workshop: Mr Ameen ul Haque curated the session introducing budding minds into the craft of poem writing. 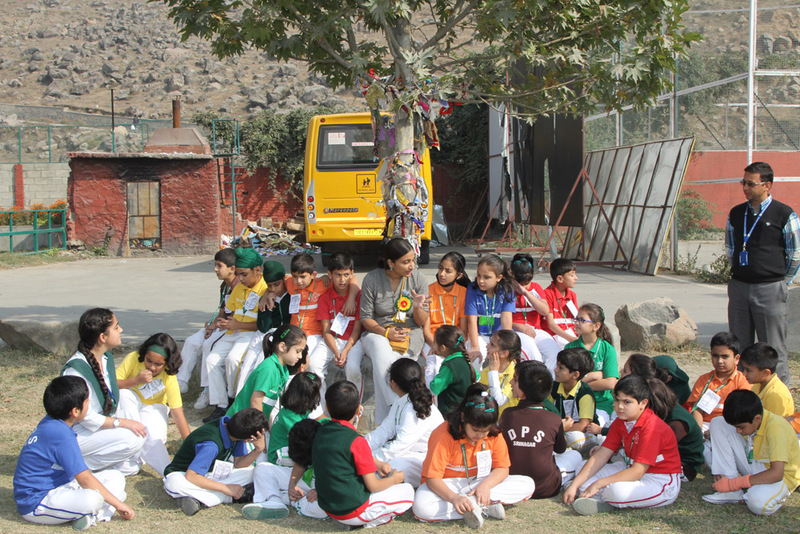 Students learnt to create poems by the use of mimetic words like fall, stop and run. The element of harmony and music was inculcated through the establishment of a refrain e.g. I can. Through this activity several important life lessons were learnt e.g. emphasizing the value of determination through a simple activity: narrator establishing an endeavor e.g. I will love my country and the chorus repeating I can. The proof that this activity appealed to students was furnished by one student who when asked what he liked about the activity replied that he liked everything about it. Studio: Sandhya Rao curated the session. 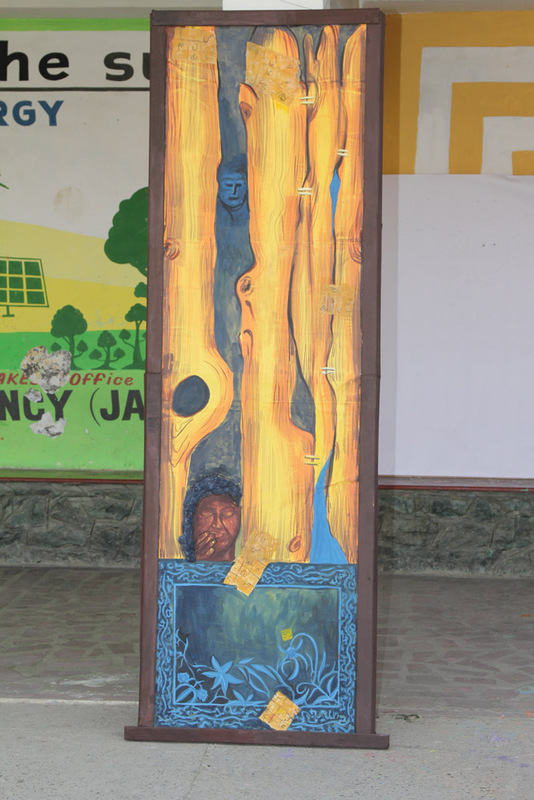 Through the use of carefully curated stories, she emphasized the theme of eco-preservation. 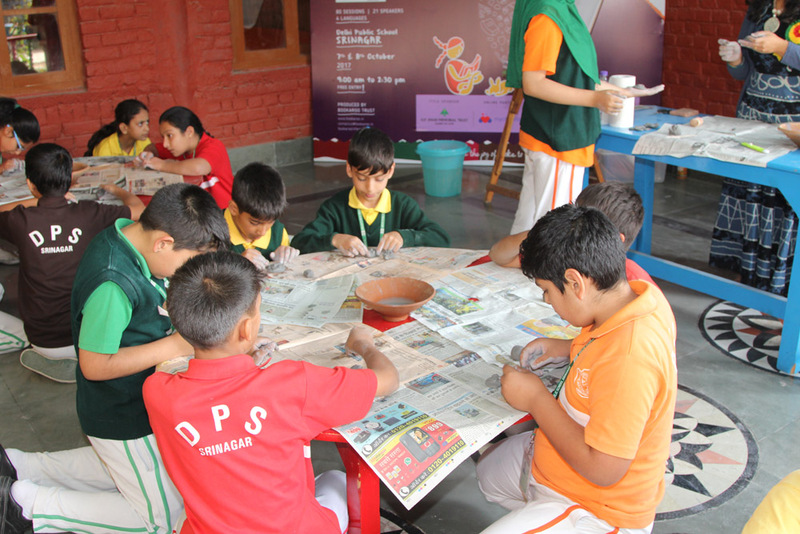 The curator distributed painted boards, seeds, small cups of soil and shells to provide students a hands on experience in workings of nature. The extent of student’s involvement could be seen from the fact that students disciplined each other thought to be talking loud. 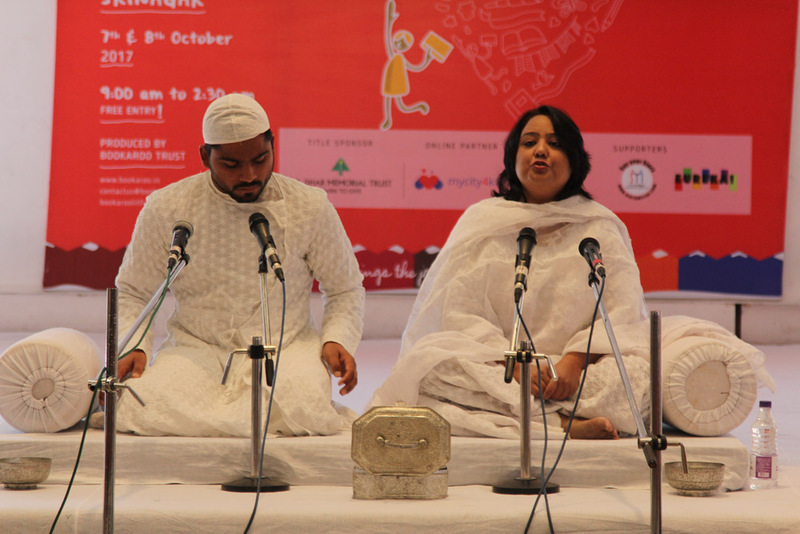 The Auditorium: Kameel Pruthi (vocals) and Rajeev Bandhani (tabla) curated the session. They performed a musical tale of the ‘Blue Kangaroo’, that they performed in the morning again before a different set of students. The reactions were no different this time. 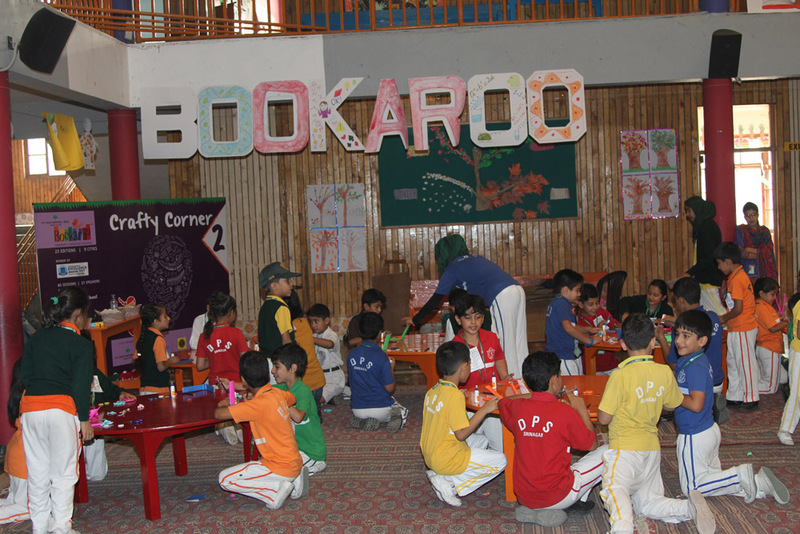 The students nodded vigorously to the beats of table as the lure of the engrossing tale made them detached from the outside world, and completely immerse their little minds in the story. 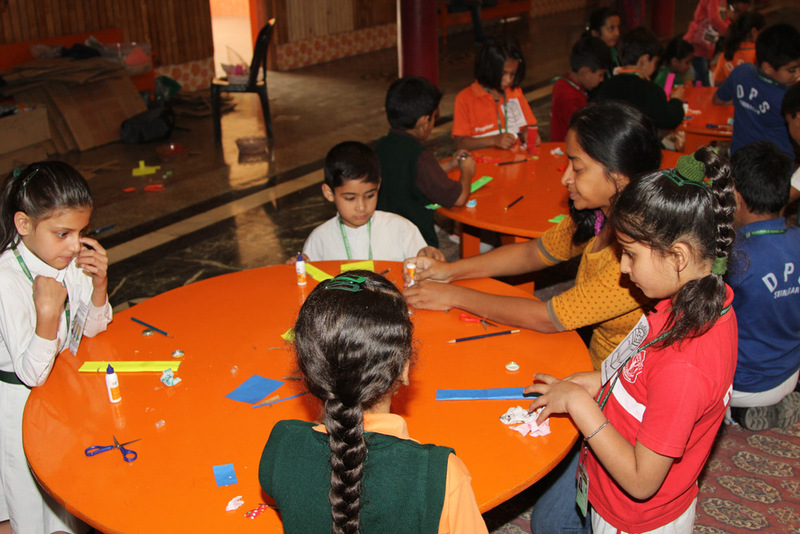 Craft corners: These fun filled sessions were curated by Ludwin Mascarenhas, Team DK, Team Eklavya and Tinkle. 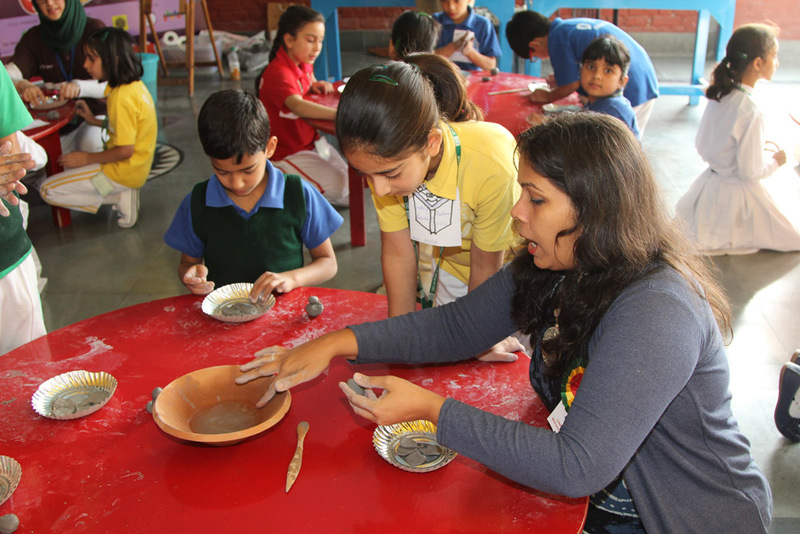 The sessions kept the students busy with their hands, and their eyes glued to the things. 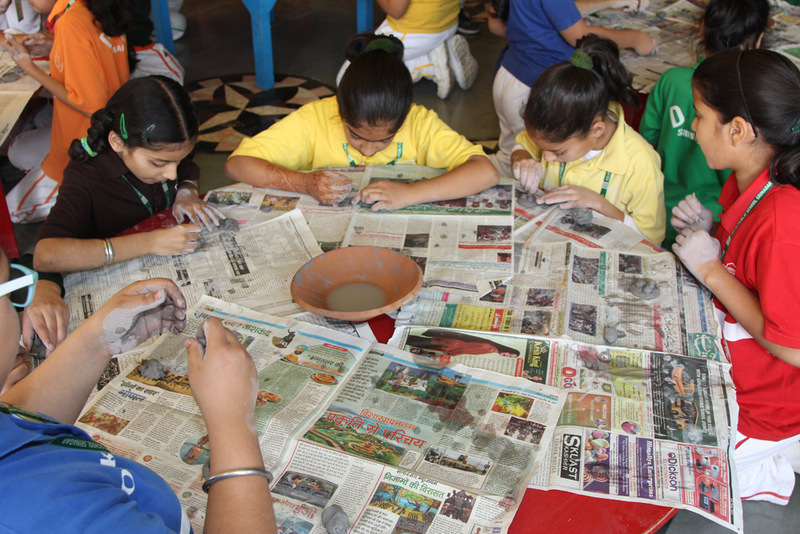 Students learnt to craft a rudimentary hand puppet, and drawing a frowning clown from mud. 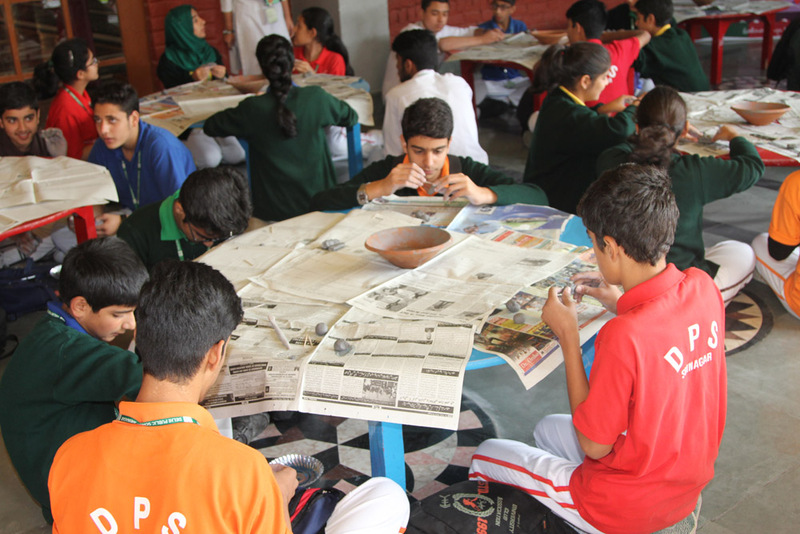 One other session mirrored that of the first session where students learnt to put waste material to good use and create useful things like a cap or a paper boat from scrap paper, glaze papers etc. One more session involved creating superheroes from prefabricated sheets showing story plotlines to be coloured. 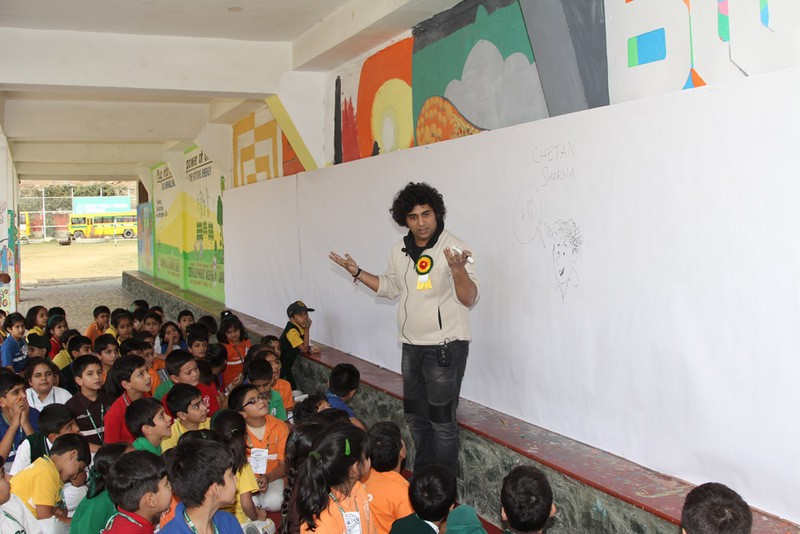 Doodle Wall: Chetan Sharma curated this session of superheroes. Not often does one realize the effort it takes to create characters one took for granted in childhood. 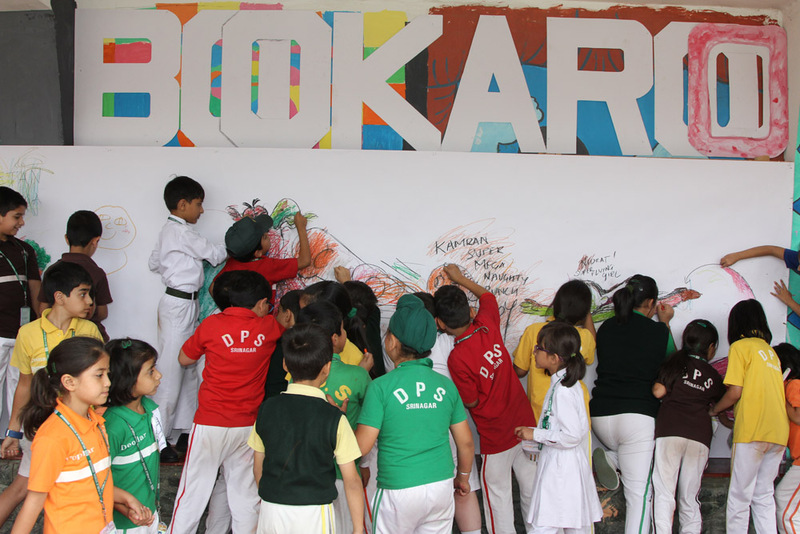 Interactive Sketching made the onlooker aware of the immense effort it takes to create characters like superheroes popular with children. 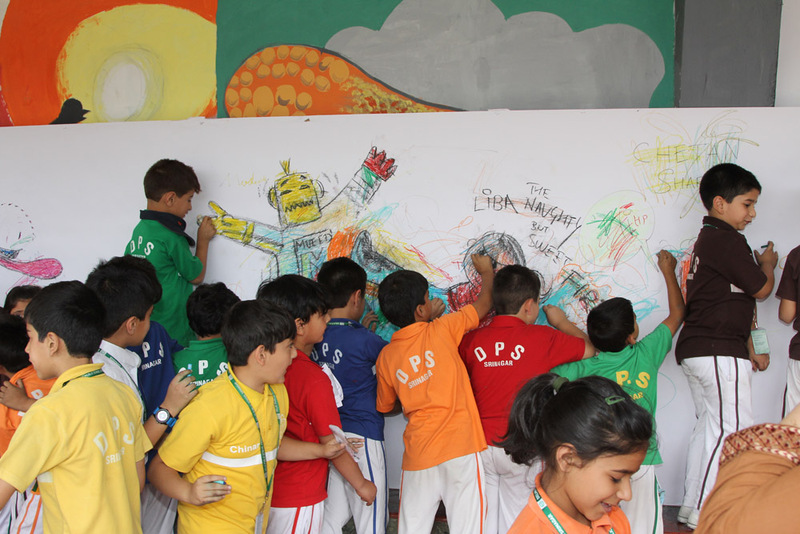 The children were observed enrapt, and busy with hands and smiles watching and drawing their superheroes in action. They observed with interest the creation of characters like a dragon and super flying girl Nidrat named after a student. 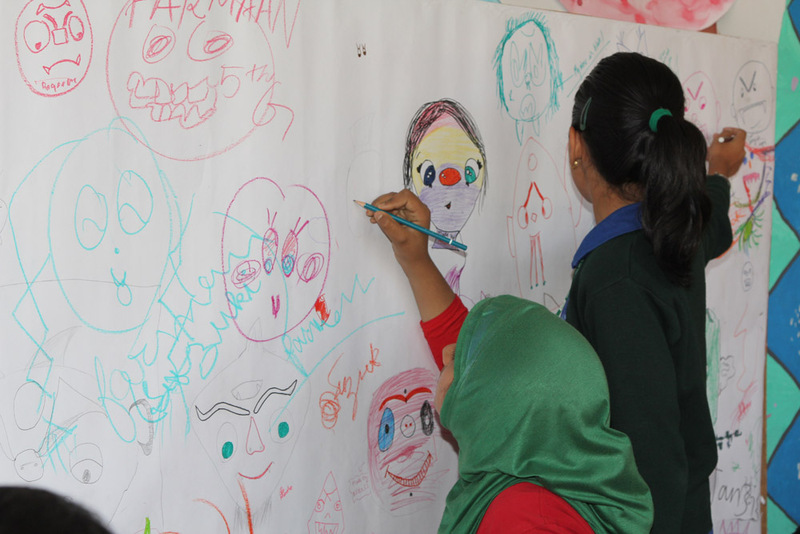 The children were seen pitching in with suggestions about which characters to draw and their details. 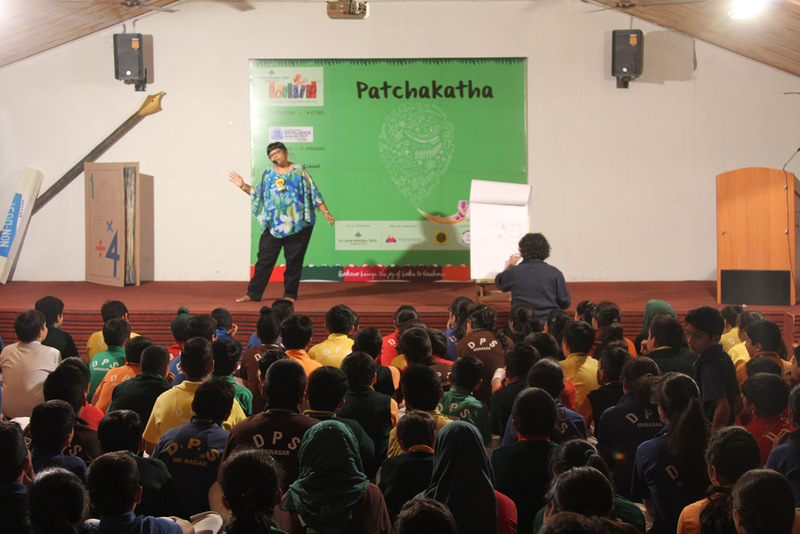 Patchakatha: These were two sessions of storytelling once again held by Jeeva Ragunathan and Ajay Dasgupta. 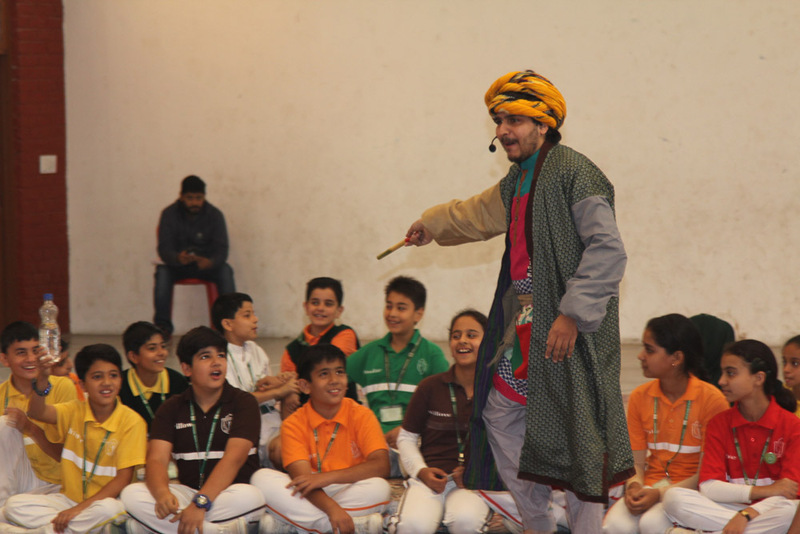 The students enjoyed the musical rendition of stories, and dancing to them each outclassing the other in terms of sheer delight and enjoyment. One story that the students quite enjoyed revolved around the two brother clever and fool. While clever exploits the fool at every juncture, the fool’s bravery rescues him at the end. The story pointed out the value of courage and responding to adversity. 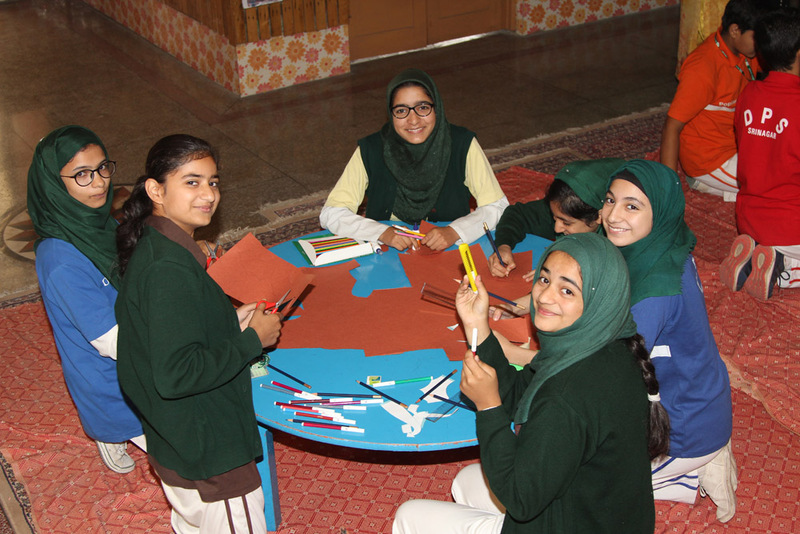 Without even noticing, the students were educated about pressing issues like environment conservation, ethics, and response to fear. It was a perfect culmination to what has been a very satisfying and fun-filled day. 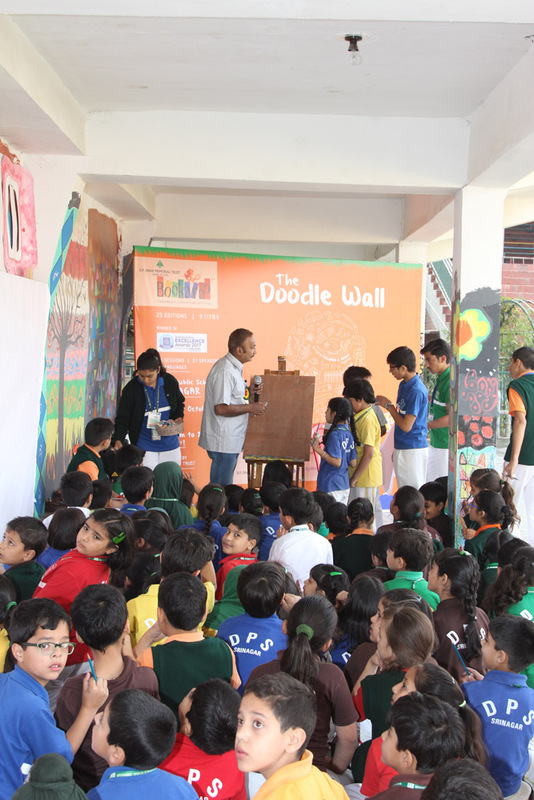 Doodle Wall: Team Amar Chitra Katha curated the session. Children were fascinated as pictures came to life before them. 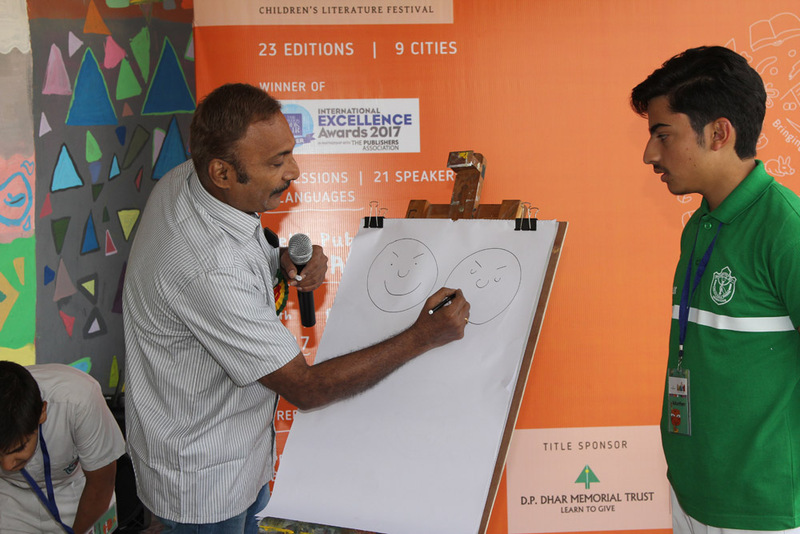 The different moods, and emotions of cartoon characters explored in the sketching session bewildered and fascinated the audience. Studio: Deepak Dalal curated the session. 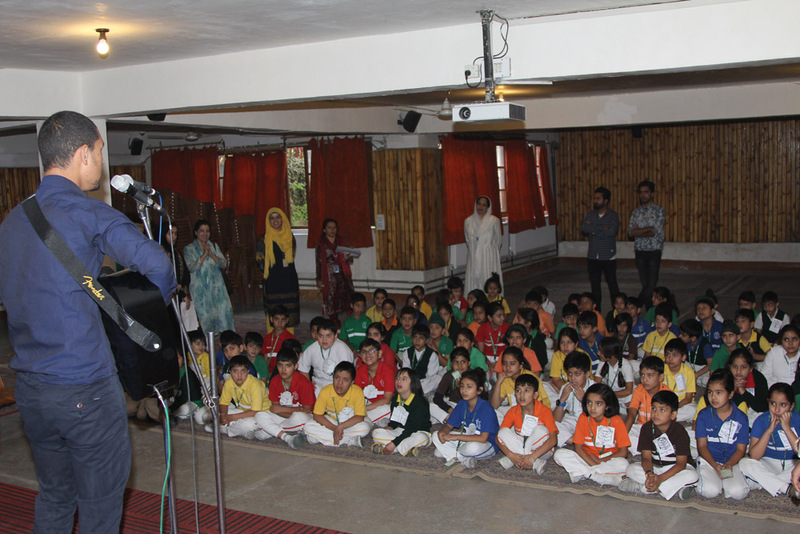 The session revolved around the majestic snow leopards of Kashmir. 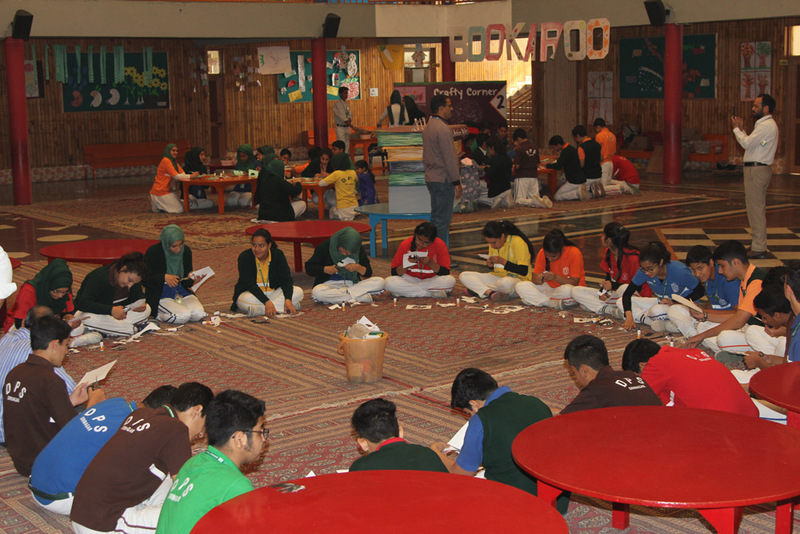 Through a mixture of narrative and entertainment, students learnt some interesting facts about the other fauna of Kashmir. It was a perfect example of the efficacy of non-formal learning. 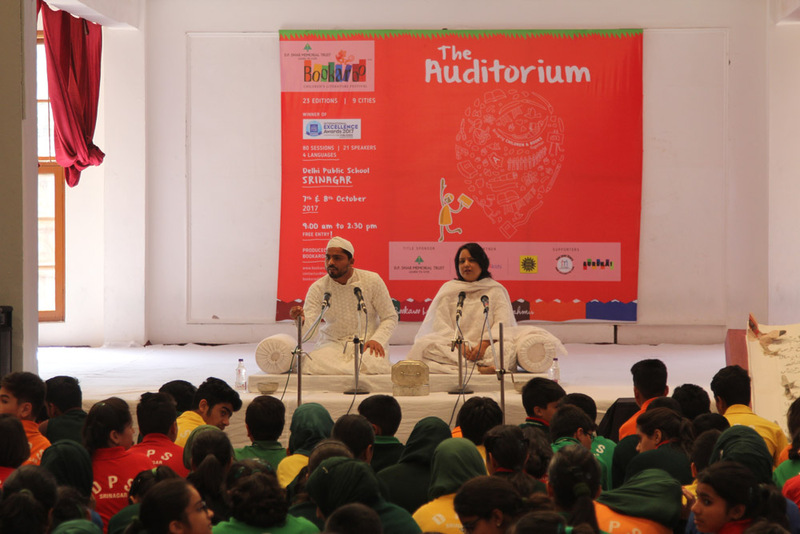 Auditorium: Kamal Pruthi and Rajeev Bandhani curated the session which revolved around a musical exploration of the famous character – Mulla Naseerudin –renowned for his witticism. 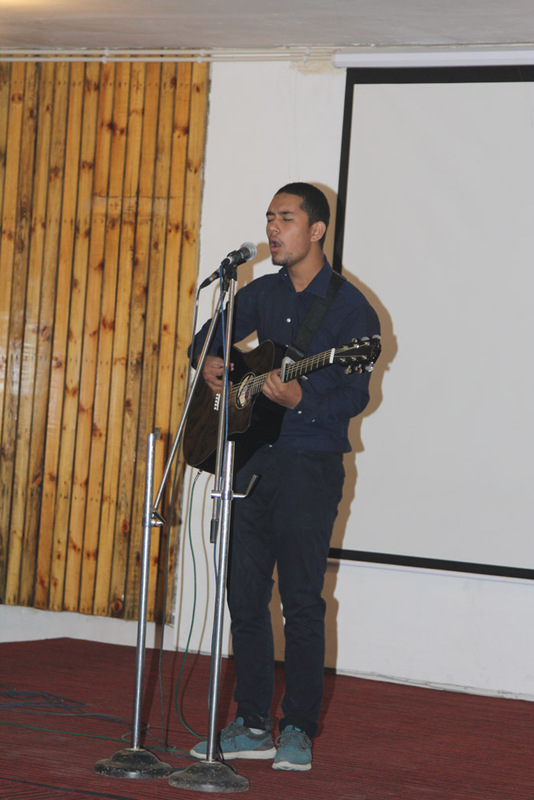 The performance brought the dry ambience of desert to a chilly October morning. Workshop: Sandhya Rao curated the session. The session focused on the crucial issue of food waste, as students embarked on a journey to discover the horrifying truth into the murky world of food waste. 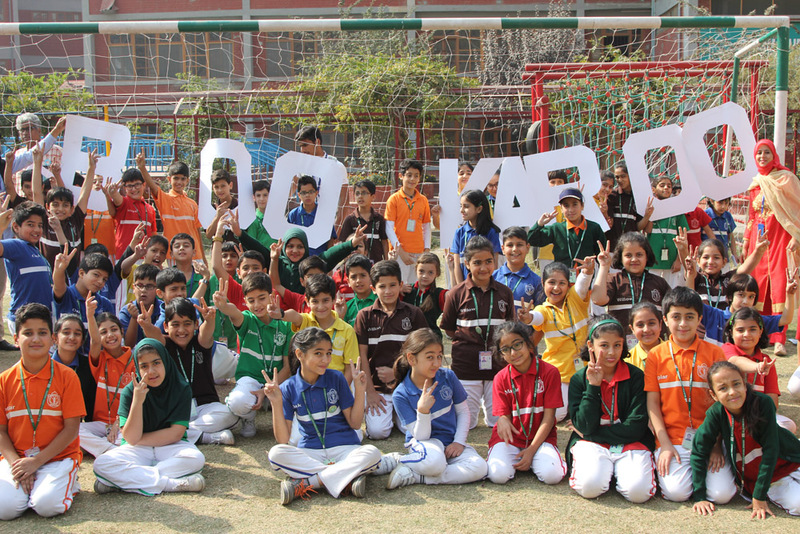 Without even noticing, the students were educated about the role they can play in countering this menace. 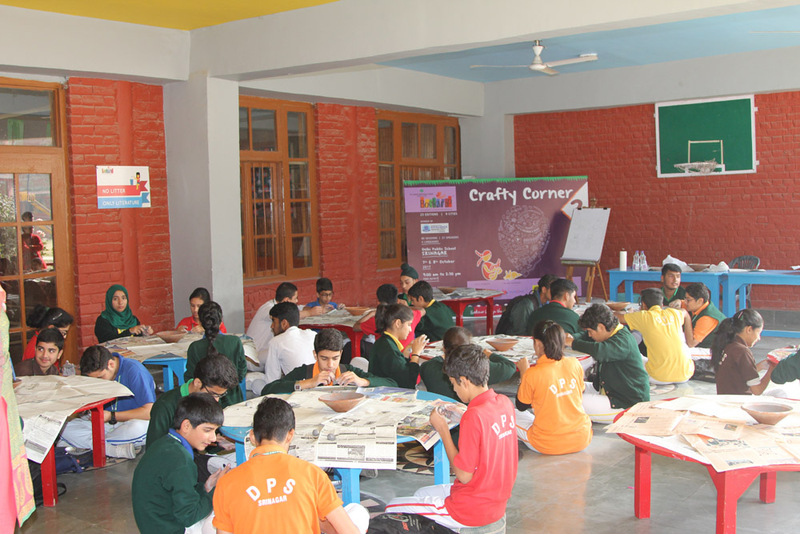 Craft corners: These sessions were curated by Ludwin Mascarenhas, Indu Harikumar, team DK and Team Amar Chitra Katha. 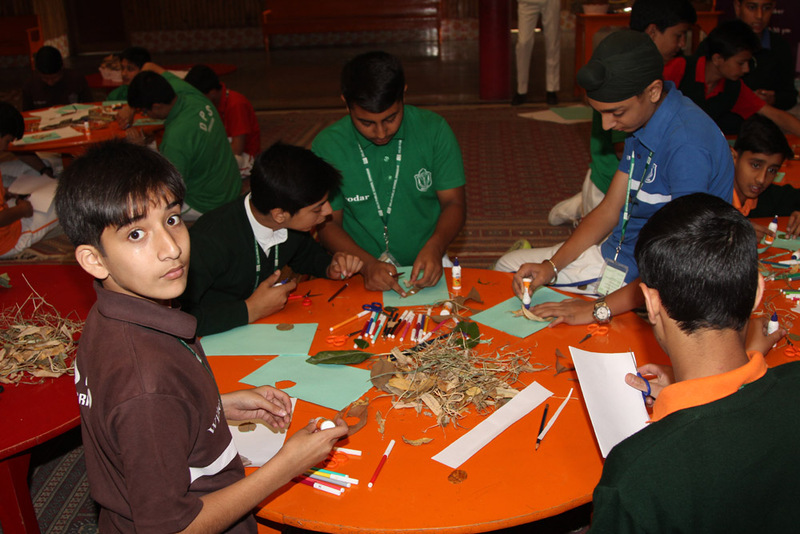 Students were trained in different art forms through interactive sessions. 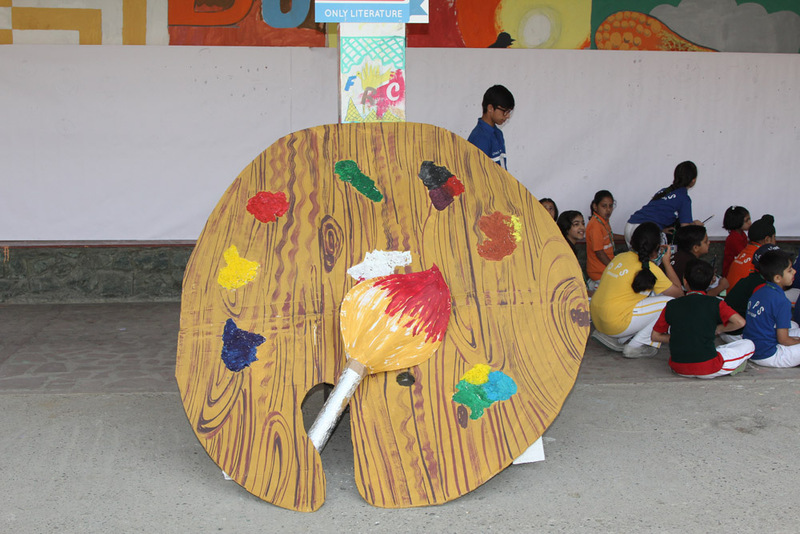 The forms including creating art like lions and greeting cards through waste material like rags, discarded paper, cardboard strips and bottle caps or creating glittering decorations and creating various shapes from mud. 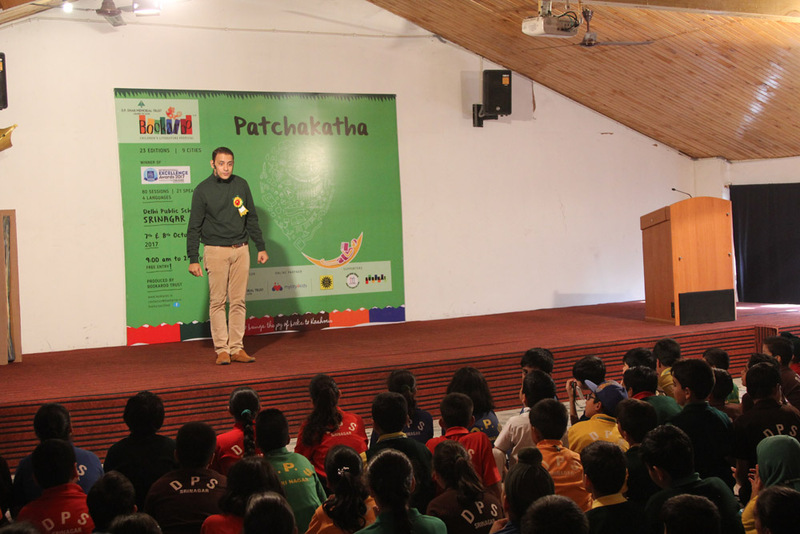 Patchakatha: These were two sessions of storytelling one held jointly by Jeeva Rgunathan and Chetan Sharma. 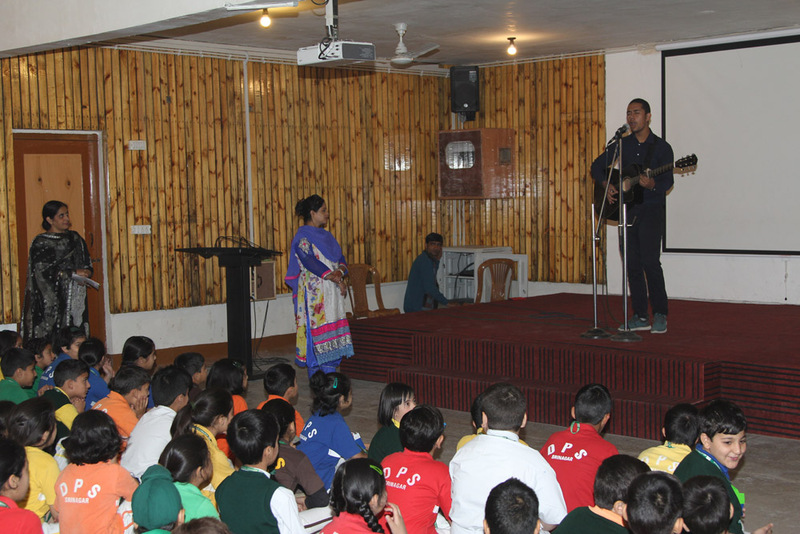 The students were entranced by joyful yet expert rendition of the stories that seemed to have sprung out of books and enlivened by a lively joviality. 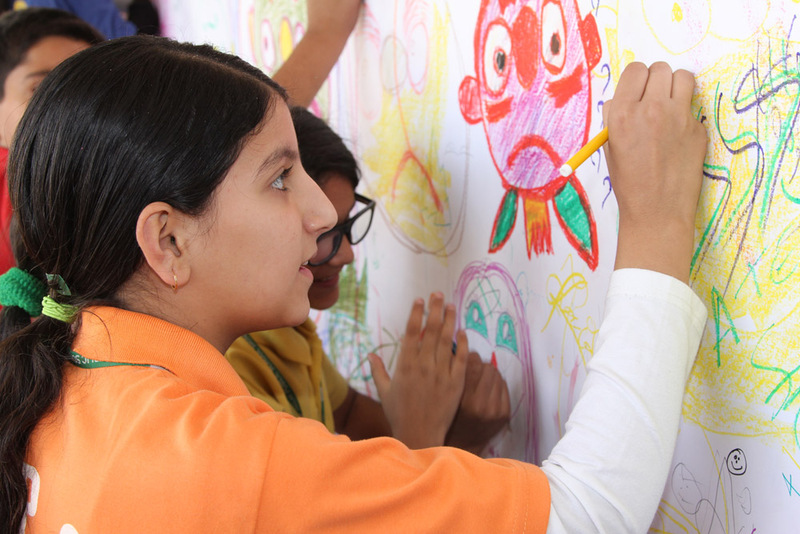 Doodle Wall: Ashok Rajagopalan curated the session. 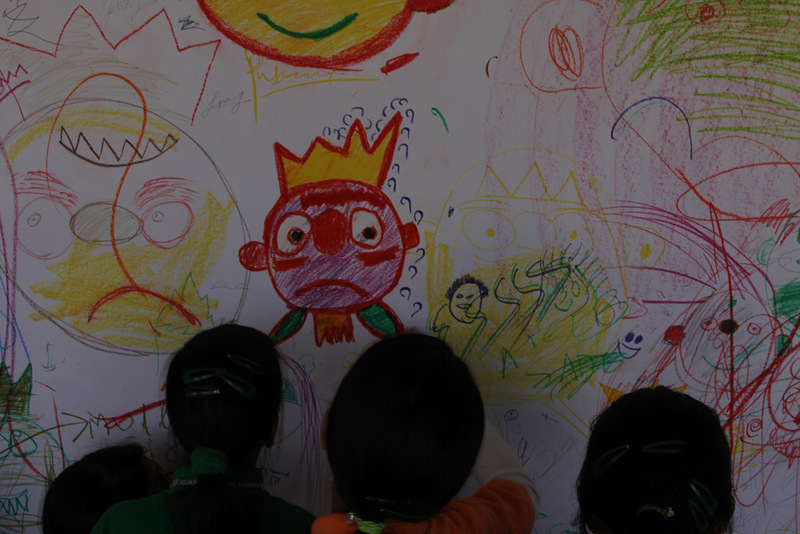 Children were hooked on as grumpy monsters came alive on the bare wall as if through magic. And yet at a second glance the monsters looked kindly. The duality fascinated the students as they looked on with curious eyes. Studio: Jeeva Ragunathan curated the session. 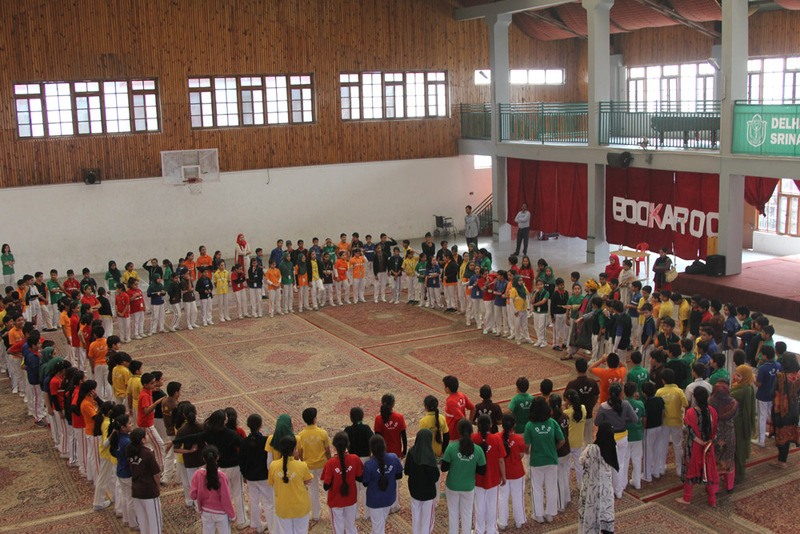 The session highlighted an important aspect in character building – the ability to face and transcend problems. 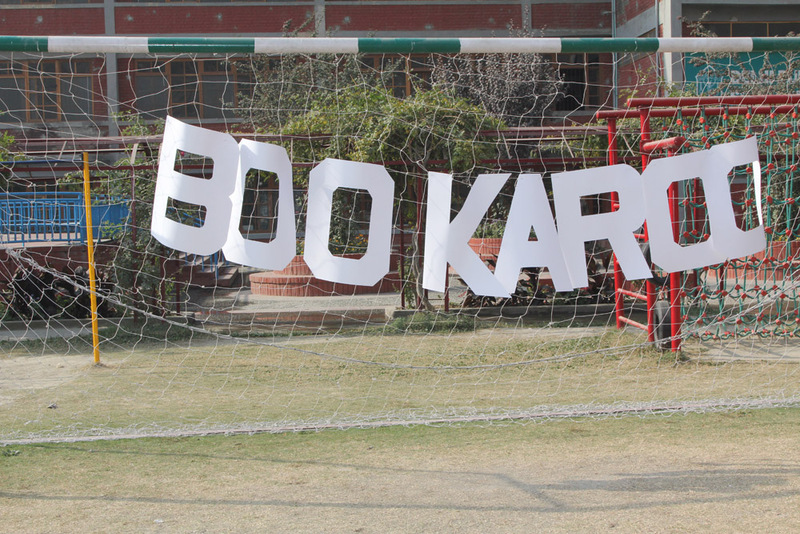 The story of Kartik frustrated in his desire to play football at his new school demonstrated the importance of perseverance to students. 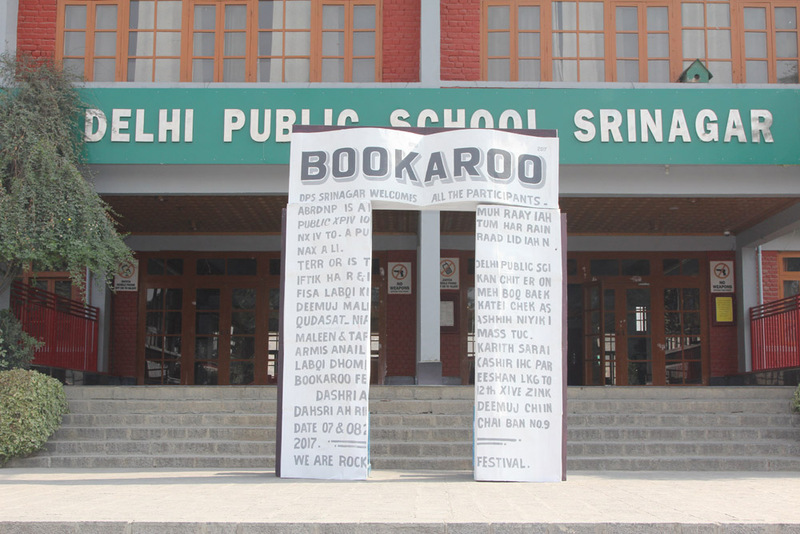 Auditorium: Fouzia and Firoz supported by Story Mirror curated the session which brought alive the story of Mahatma Gandhi’s journey from England to South Africa and back. 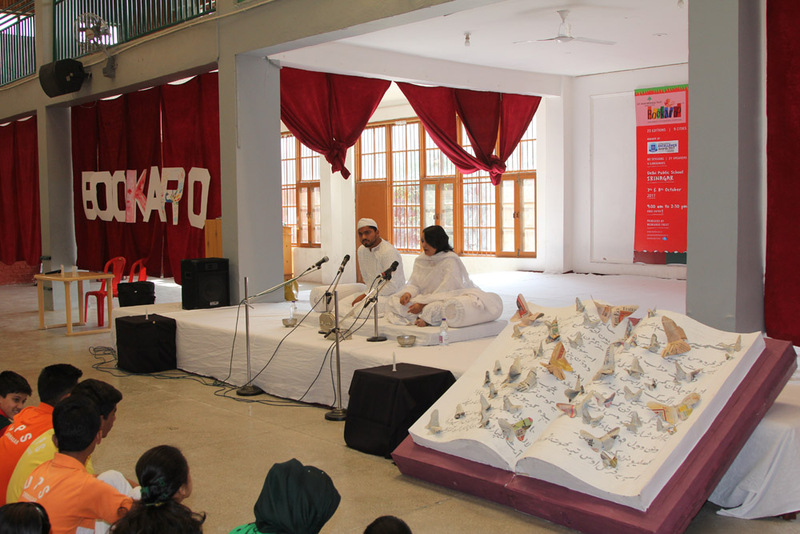 The performance brought alive the historic journey through a stylized dastaan complete with historic speeches, humorous anecdotes and Urdu poetry. Workshop: Sandhya Rao curated the session. 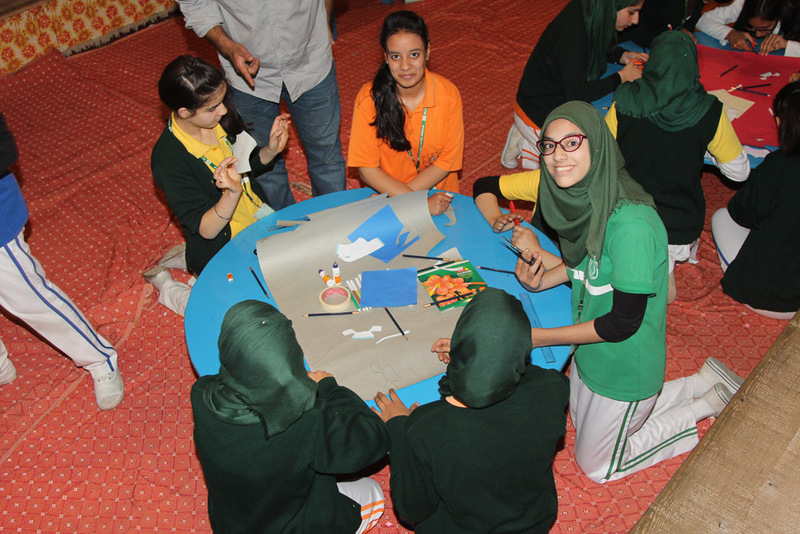 The session made students tap into their creative juice reserves and come up with exciting stories that expressed their deepest desires and dreams. 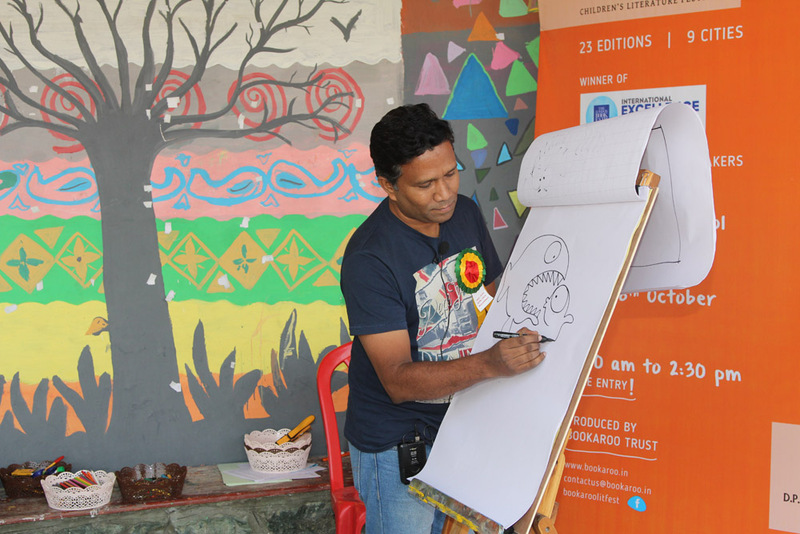 Crafty corners: These sessions were curated by Ludwin Mascarenhas, Indu Harikumar, team DK and Kavita Singh Kale. 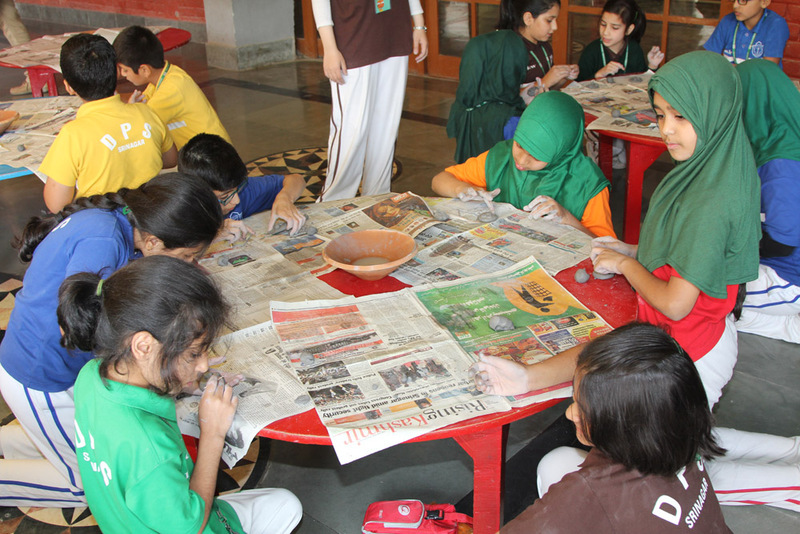 Students were trained in different art forms through interactive sessions. The forms including creating art like insect forms, lions and greeting cards through waste material like rags, discarded paper, cardboard strips and bottle caps, designing masks and creating vegetable forms from mud. 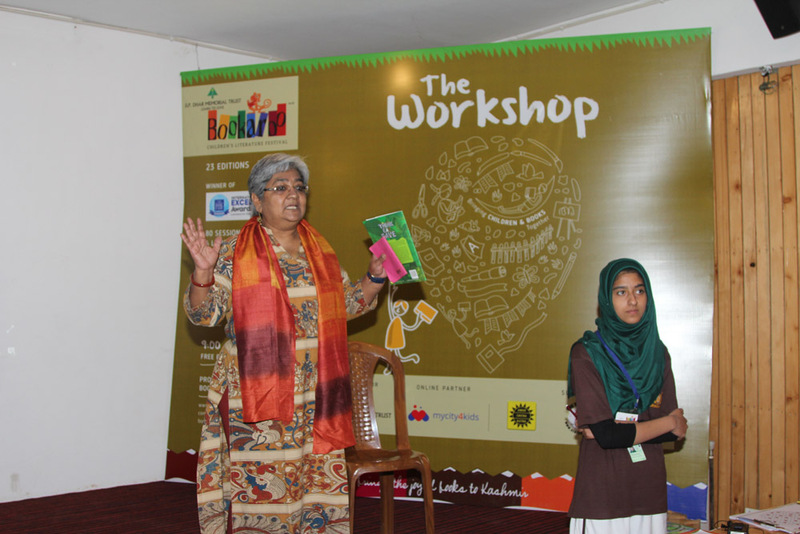 Patchakatha: These were two sessions of storytelling held by Ameen ul Haque and Ajay Dasgupta. 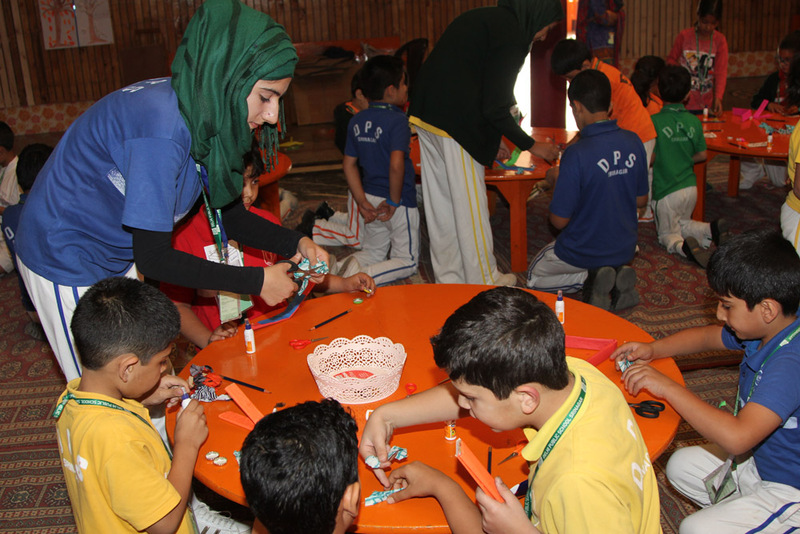 The sessions took students aboard a futuristic time machine and explore the futures that lie hidden from the eye. 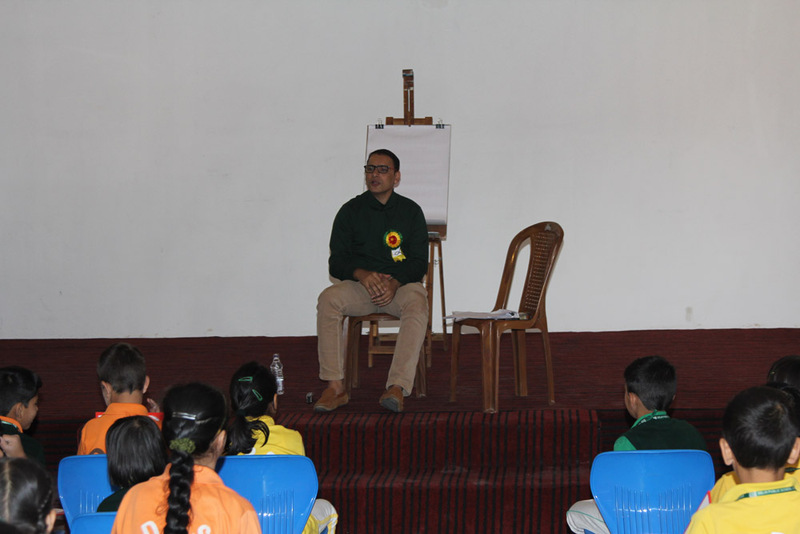 Ajay Dasgupta regaled the students with evocative stories that revolved around unconventional characters like a mouse merchant. 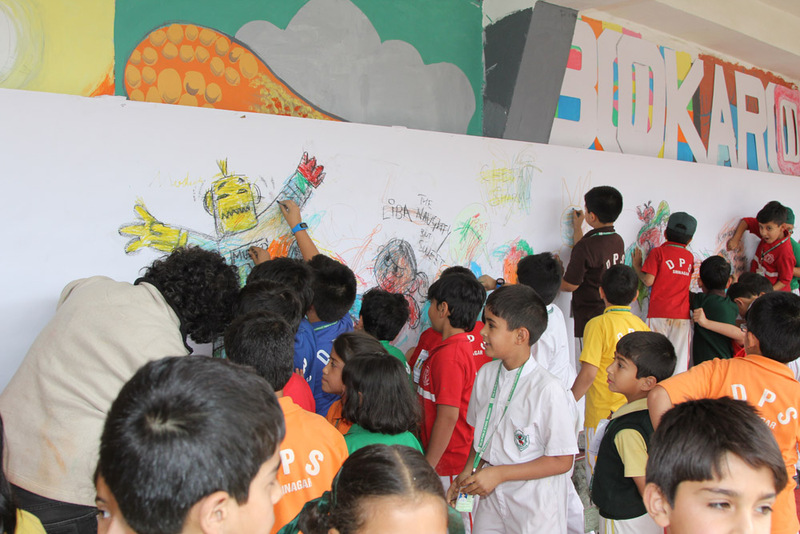 Doodle Wall: Team Amar Chitra curated the session. 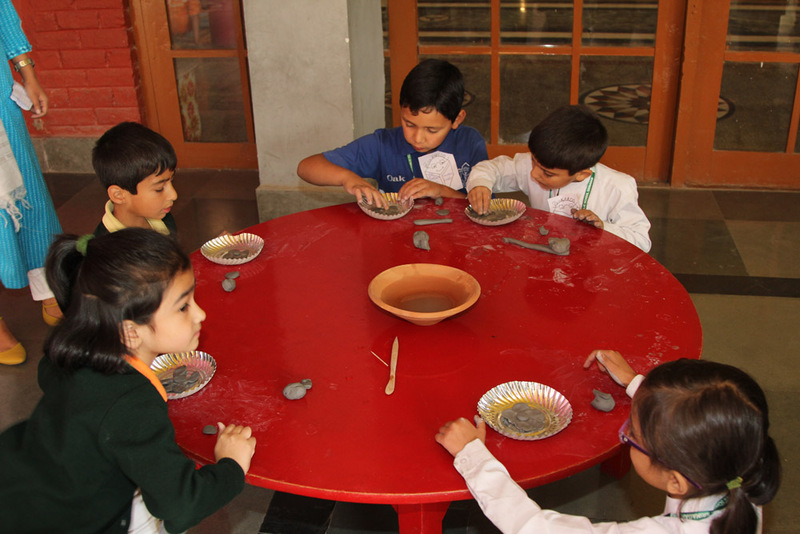 Children were engrossed in the various possibilities inherent in art as the resemblance things show to each other like a crack to a face or shapes in clouds demonstrate the diversity and fertility of human imagination. Studio: Deepak Dalal curated the session. 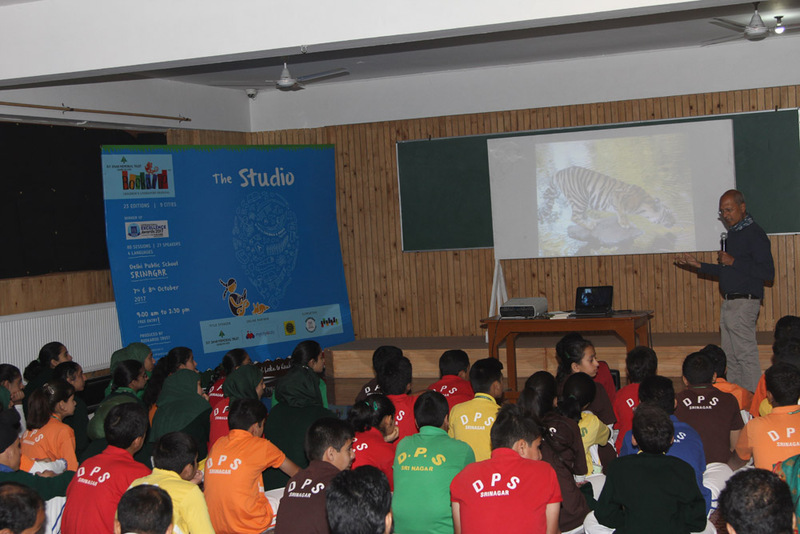 The session introduced students through carefully selected pictures and personal stories the need to rally for preservation of wildlife and other flora and fauna of the country. 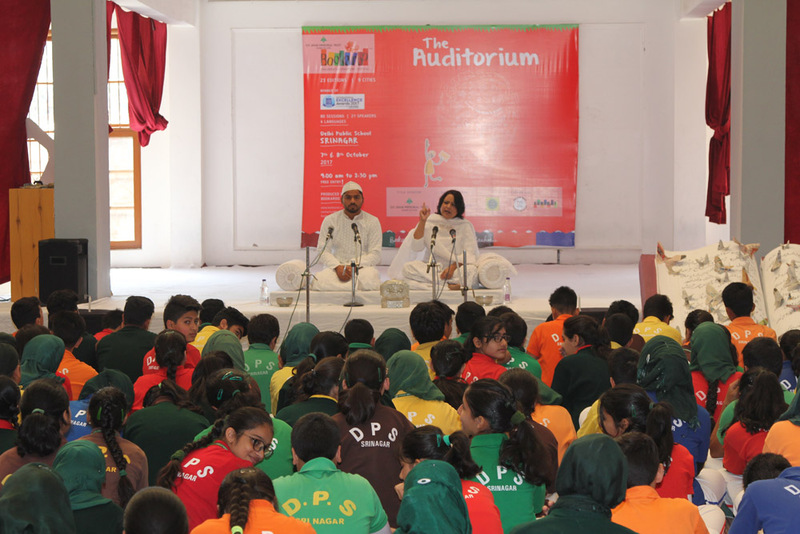 Auditorium: Kamal Pruthi and Rajeev Bandhani curated the session which revolved around a musical exploration of the famous character – Mulla Naseerudin –renowned for his witticism. The performance brought the dry ambience of desert to a chilly October morning. 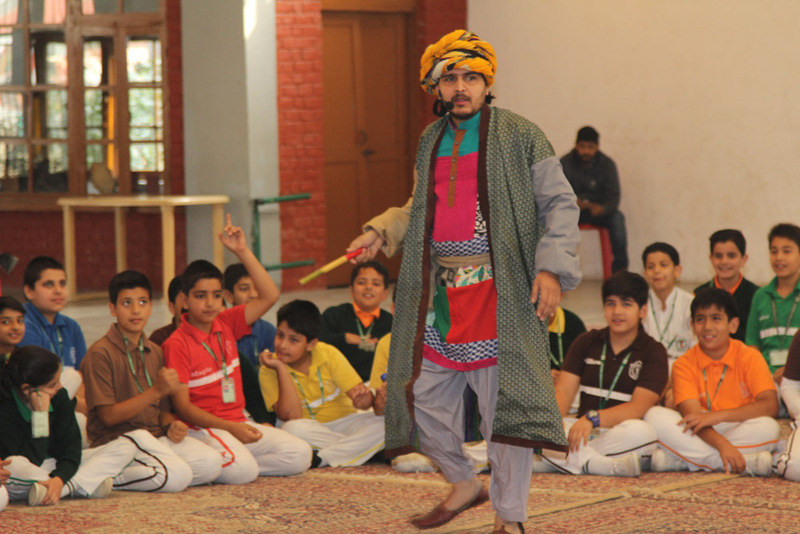 Dressed in the traditional attire and looking every bit a story teller, Kamal had the students hankering and clamouring for more. Workshop: Chetan Sharma curated the session. 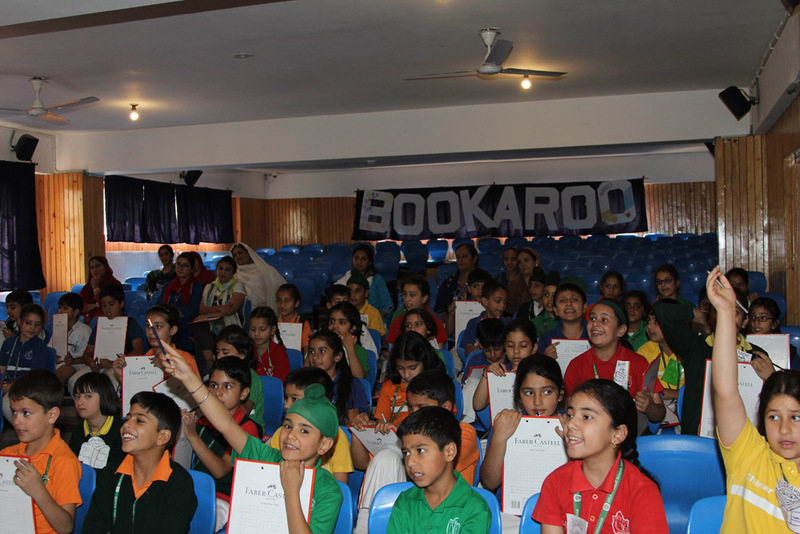 The session provided students an interesting introduction to animation. 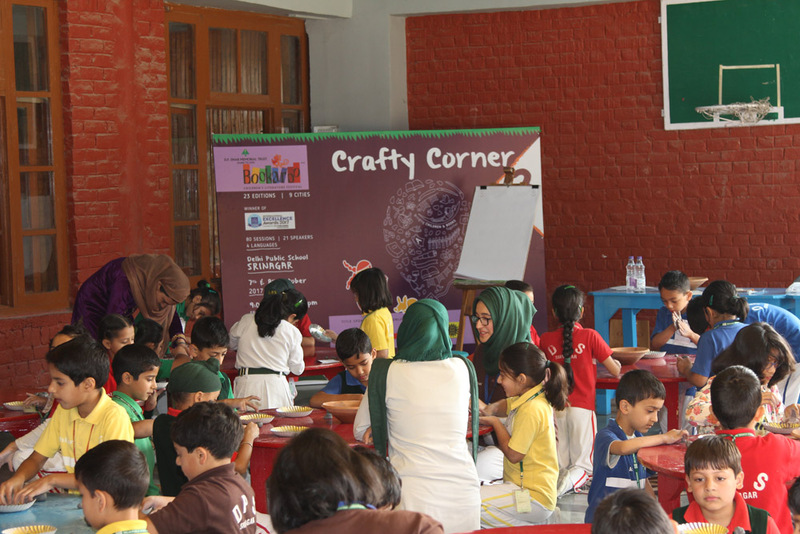 Craft corners: These sessions were curated by Ludwin Mascarenhas, Indu Harikumar, Team Eklavya and team DK. 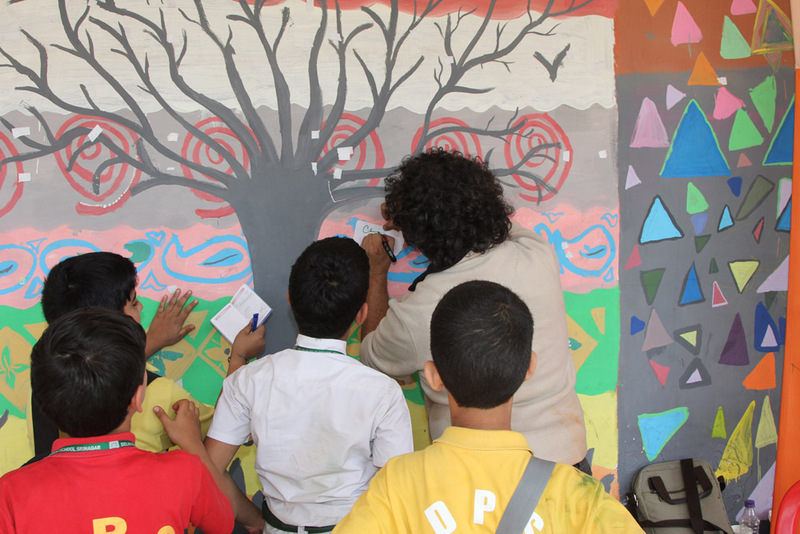 Students were trained in different art forms through interactive sessions. The forms including creating art like insect forms, lions and greeting cards through waste material like rags, discarded paper, cardboard strips and bottle caps, designing masks and creating vegetable forms from mud. 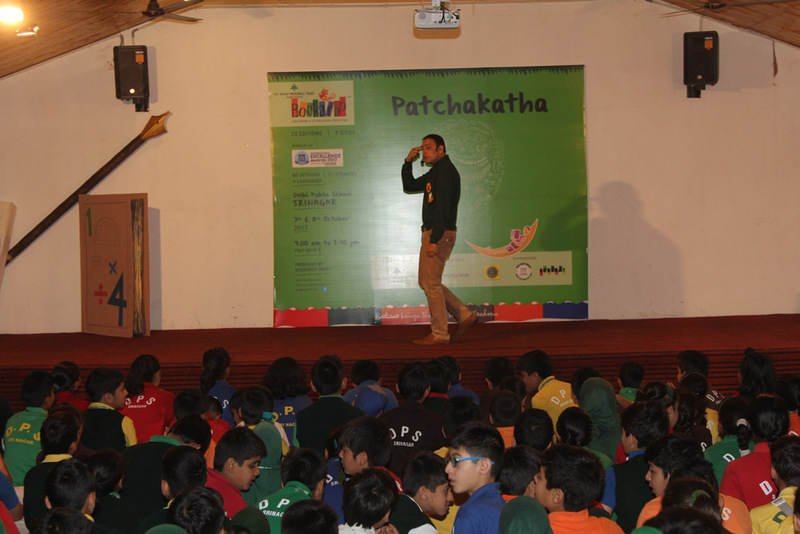 Patchakatha: These were two sessions of storytelling held by Ameen ul Haque and Taha Mughal. 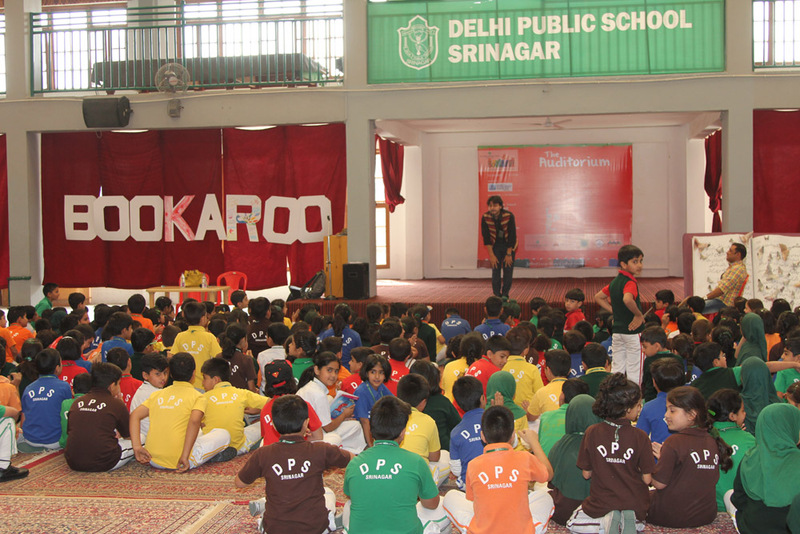 The first session revolved around a story created performed jointly by the students and the curator. The teachers too were involved in creating the story of Jo who works in a sugar factory and possesses a laaarge cat suitably demonstrated by an extension of ‘aa’ sound. 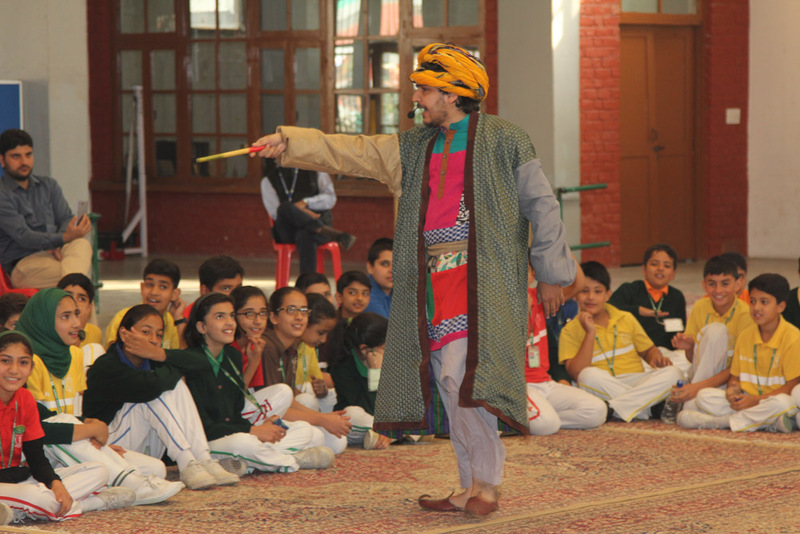 Taha Mughal entertained students with an interesting take on the traditional story – daleel full of strange quirks. 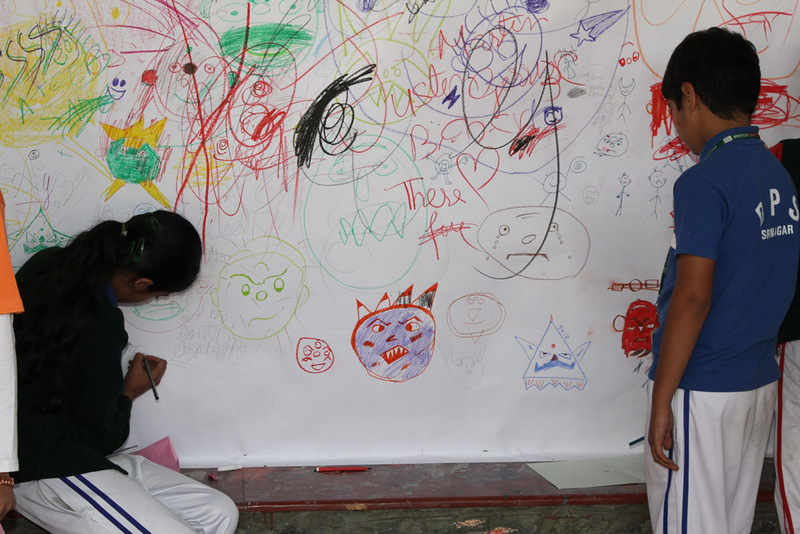 Doodle Wall: Ashok Rajagopalan curated the session. Children were thoroughly fascinated by the drawings of elephants of all sizes and shapes, waddling through the trees, bathing in the lake and feeding on sugarcane and bamboo. The students were delighted by realistic portrayals of these gentle giants. 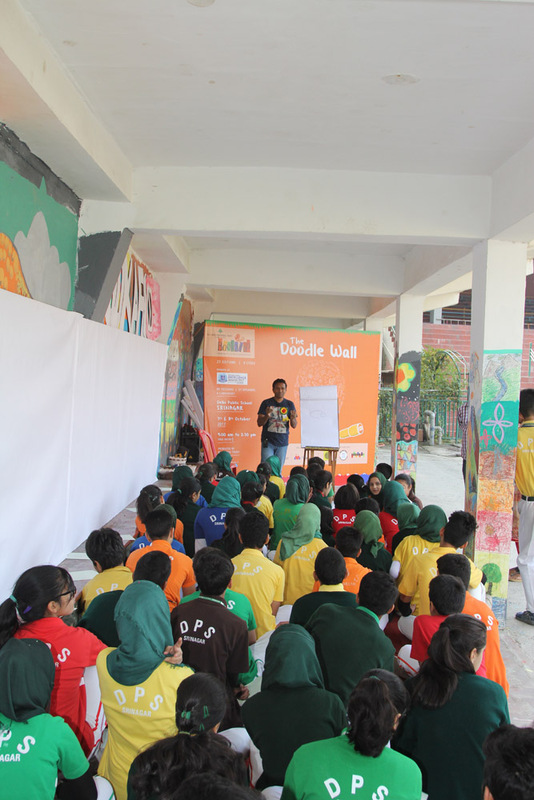 Studio: Ameen ul Haque curated the session this time around. Like an earlier held session, this session too highlighted an important aspect in character building – the ability to face and transcend problems. The story of Kartik frustrated in his desire to play football at his new school demonstrated the importance of perseverance to students. 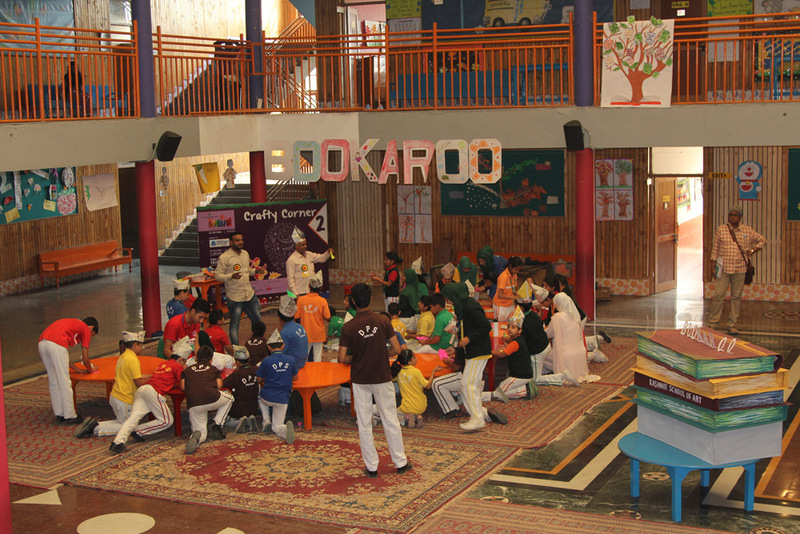 The story was told by actively engaging the audience in the act of storytelling. Auditorium: This session too was a repeat of a previously held session. 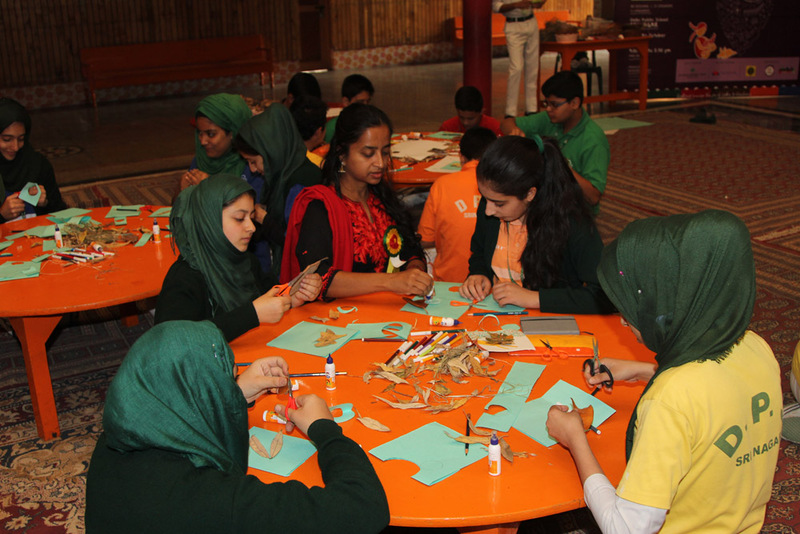 Fouzia and Firoz supported by Story Mirror curated the session which brought alive the story of Mahatma Gandhi’s journey from England to South Africa and back. The performance brought alive the historic journey through a stylized dastaan complete with historic speeches, humorous anecdotes and Urdu poetry. 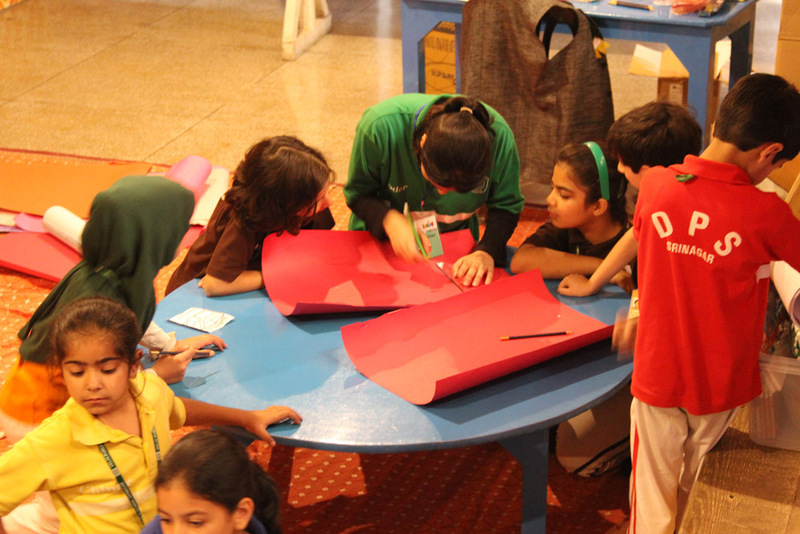 Workshop: Taha Mughal curated the session. 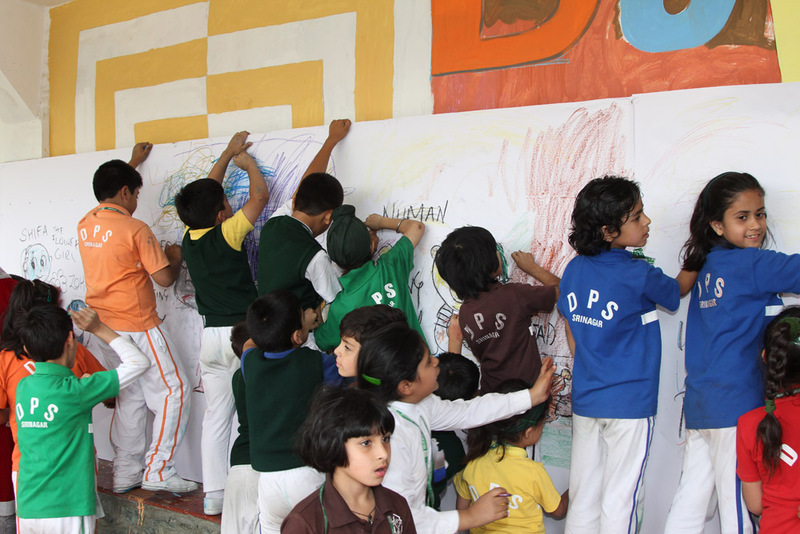 It involved an activity in which students were divided into two groups – one to create art and the other to write on it. 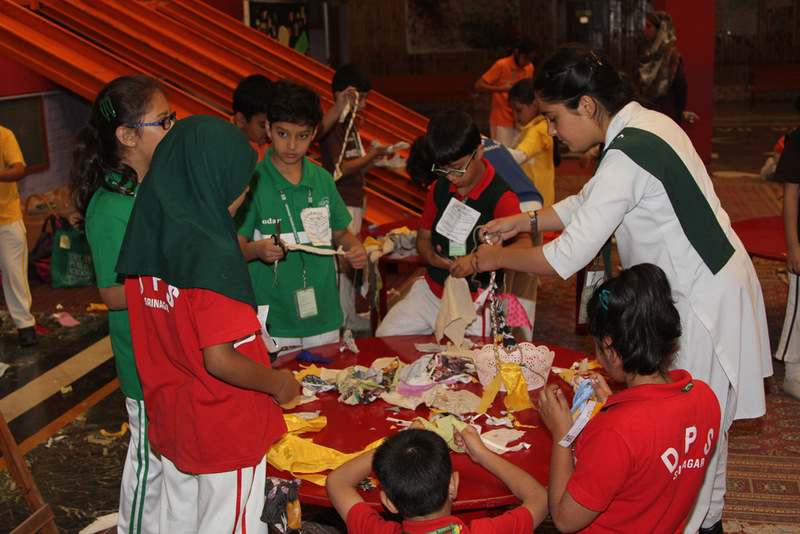 The students also learnt to write about various forms of human activity by observing student models on the stage. 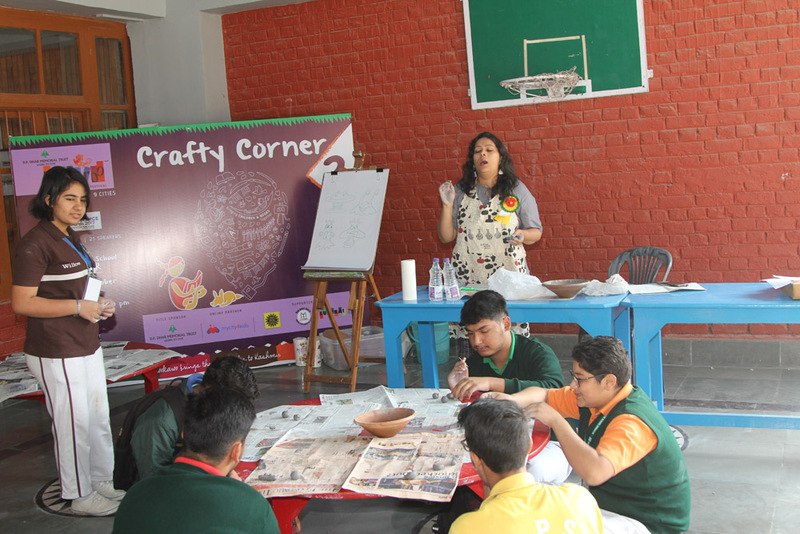 Crafty corners: These sessions were curated by Ludwin Mascarenhas, Indu Harikumar, Kavita Singh Kale and team DK. 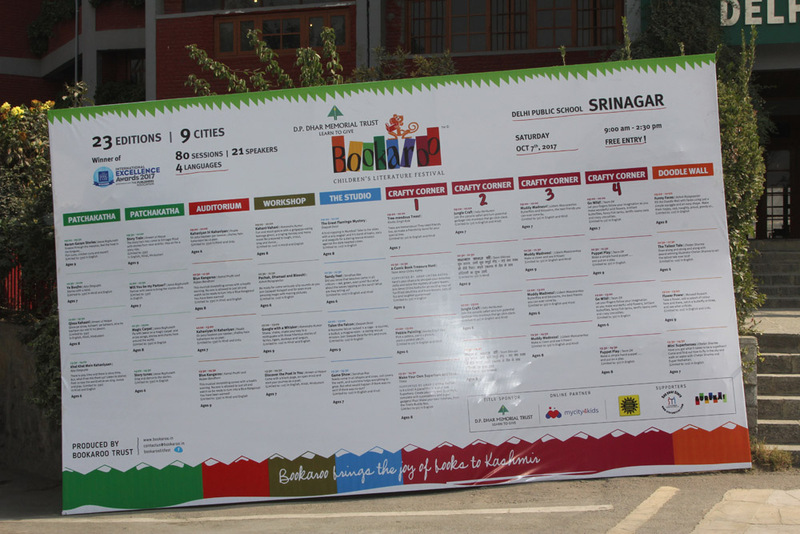 These sessions too except the one by Kavita were repeats of previous sessions. 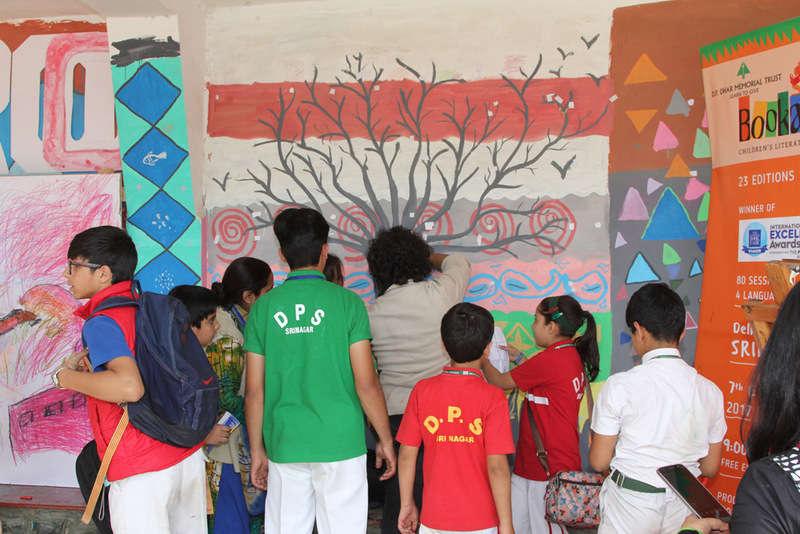 Students were trained in different art forms through interactive sessions. The forms including creating art like insect forms, lions and greeting cards through waste material like rags, discarded paper, cardboard strips and bottle caps, designing masks and creating vegetable forms from mud. 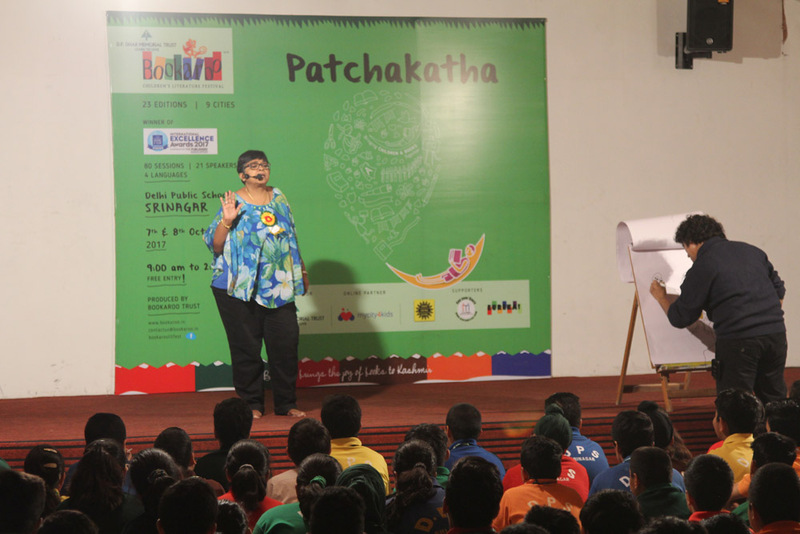 Patchakatha: Like yesterday, these were two sessions of storytelling once again held by Jeeva Ragunathan and Ajay Dasgupta. The students, like their counterparts yesterday, enjoyed the musical rendition of stories, dancing, clapping and performing the stories. The story of the two brother clever and fool was repeated again. Like yesterday the clever exploits the fool at every juncture, but the fool’s bravery rescues him at the end. The story pointed out the value of courage and responding to adversity. 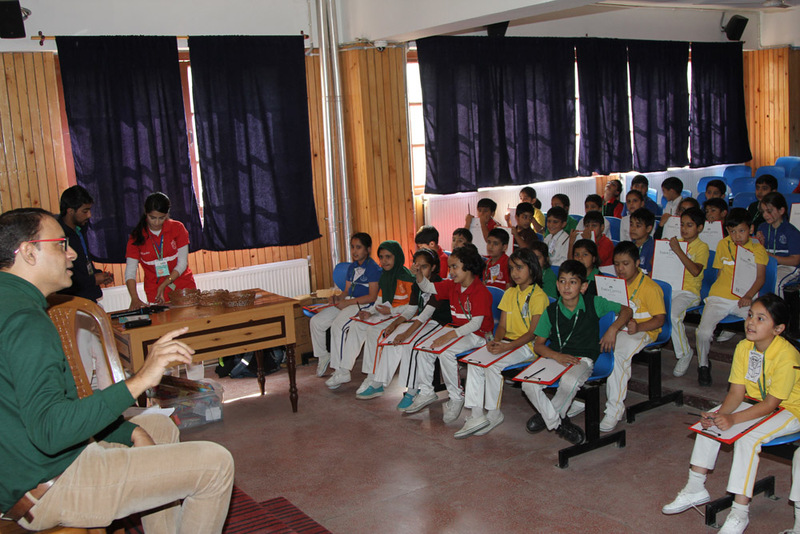 The students received a valuable lesson in important issues like environment conservation, ethics, and response to fear. 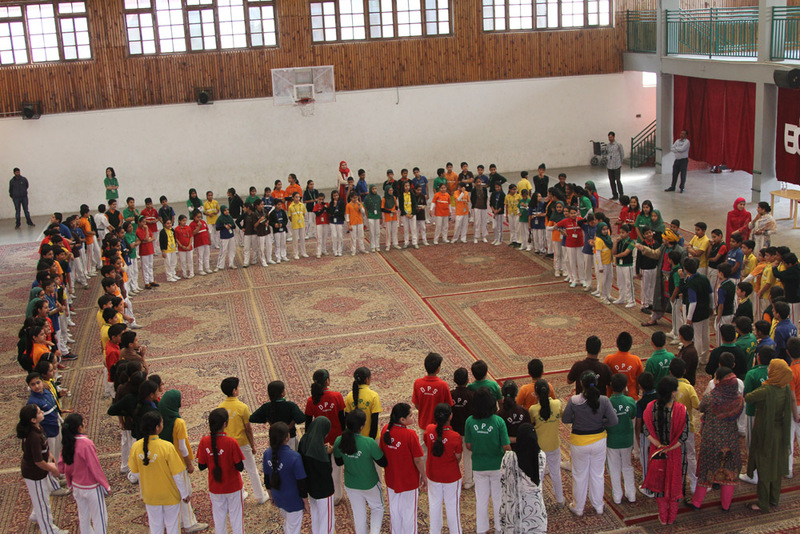 It was a perfect culmination to what has been a very satisfying and fun-filled workshop.